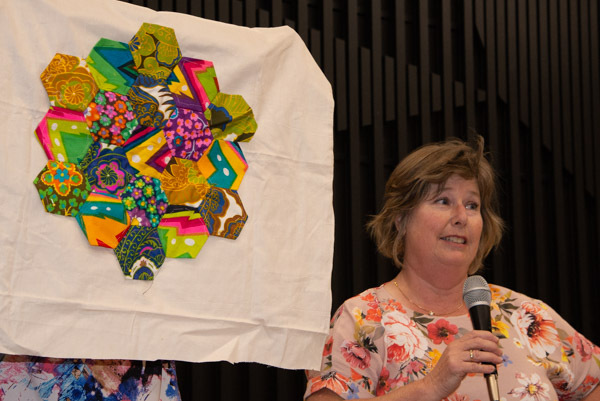 We had a lot of fun at our March meeting when quilt designer and teacher Michelle de Groot came to visit. 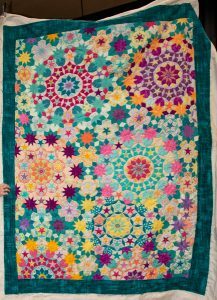 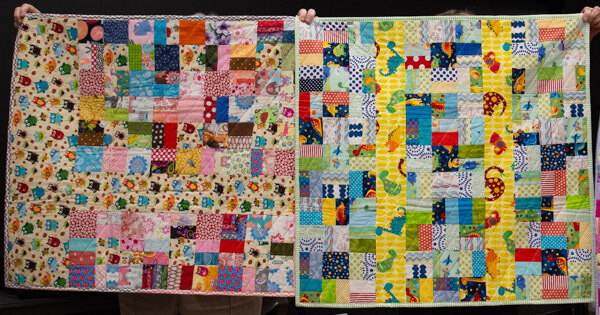 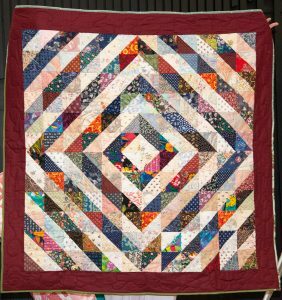 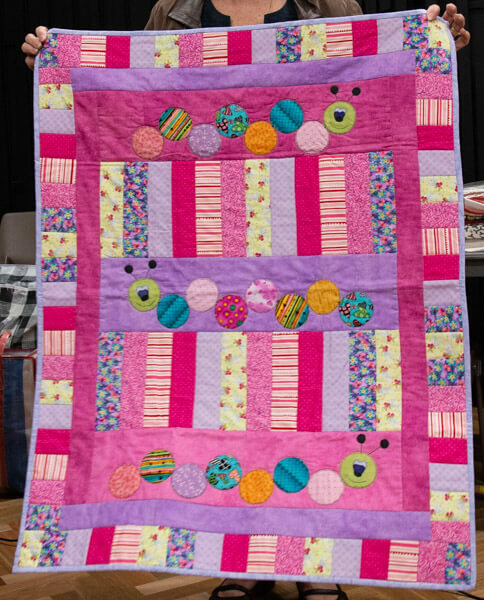 She started as a hand piecer and hand quilter, then bought a sewing machine, then a bigger one and a bigger one and she is now a long arm quilter. 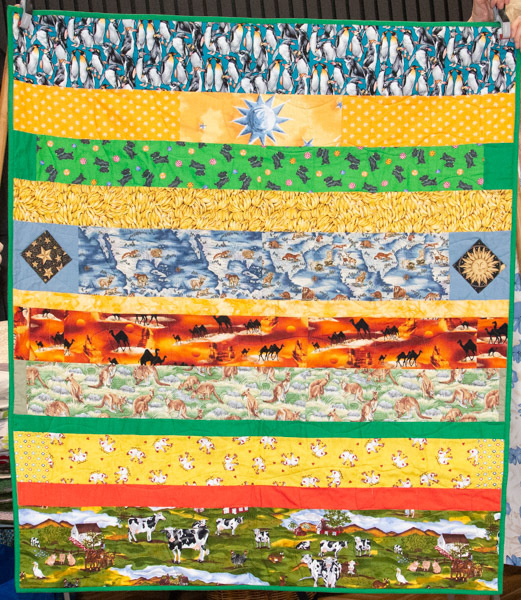 Her business based in rural Victoria is Michelle’s Patchwork. 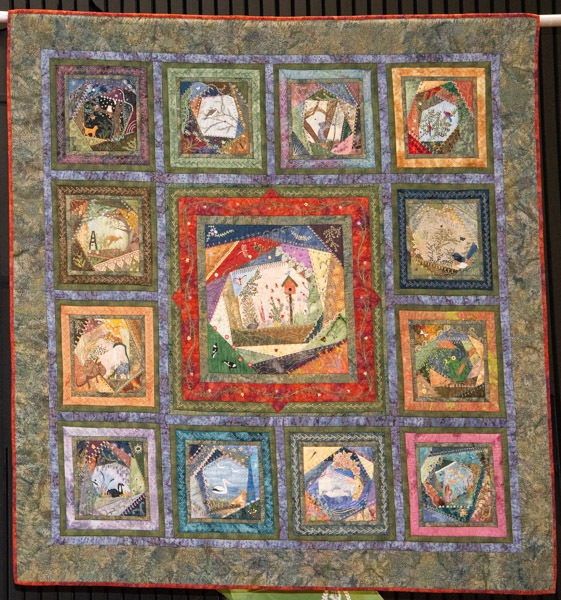 Her artistic ambitions started when she was very young but she was discouraged by one of her teachers. 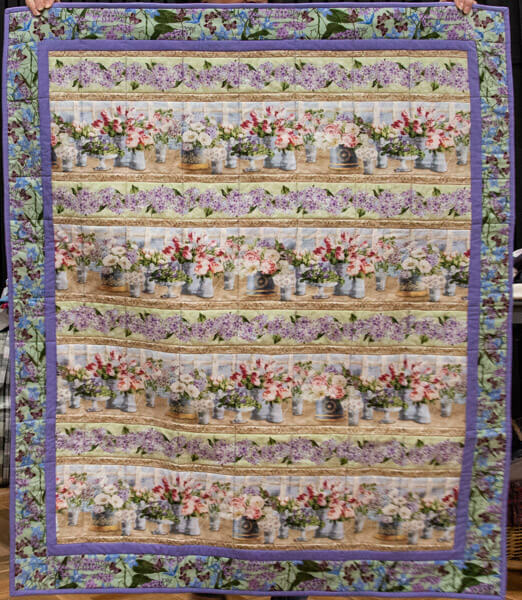 Instead she studied floristry and had her own business for many years until the time commitment was too much with a young family. 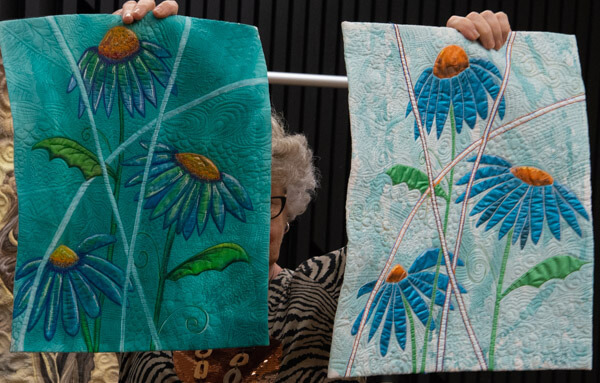 This was when she discovered quilting as a creative outlet. 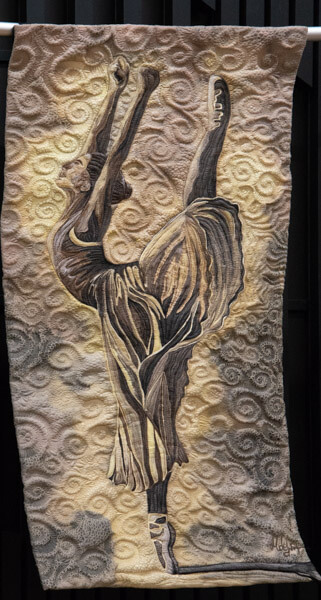 Tiny Dancer is based on an original painting by Janet Knight is the culmination of her creative dreams. 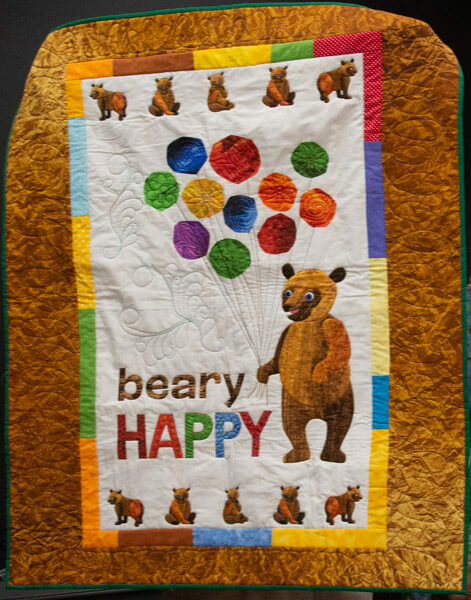 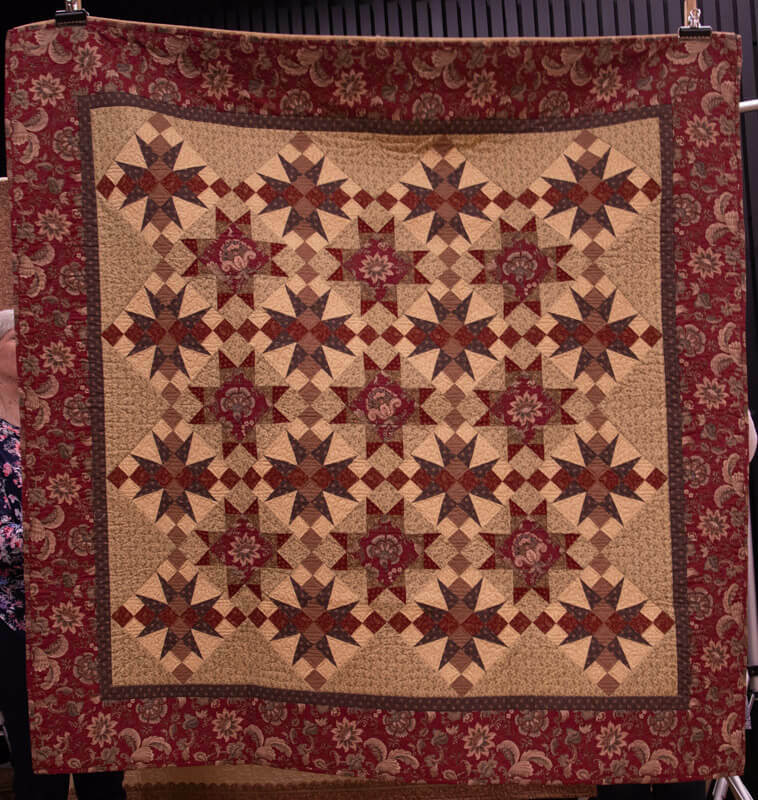 The quilt is painted then enhanced with trapunto quilting and it is going to be on The Quilt Show with Ricky Tims – a very exciting prospect for Michelle. 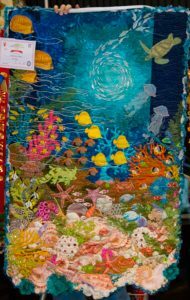 Michelle is teaching at Waverley on the first weekend in May. 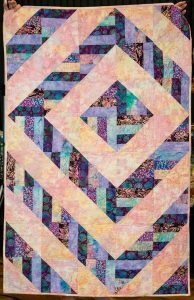 Here class on Sunday May 5 is machine trapunto which she has developed into a very easy technique with no cutting needed. 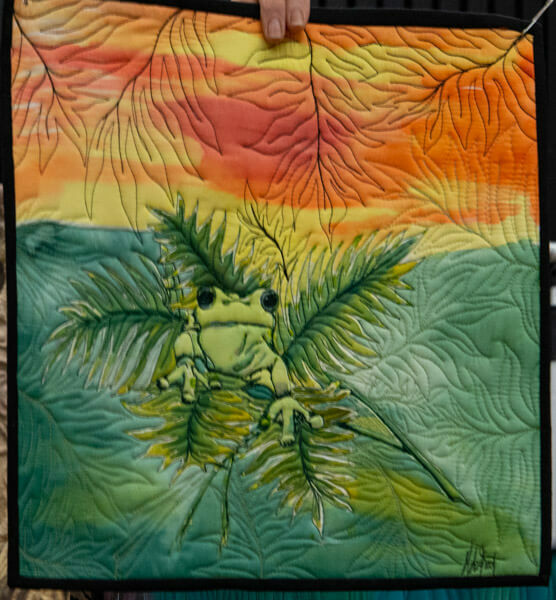 Art quilts are now a focus of Michelle’s work and she enjoys exploring lots of machine embellishing techniques. Those enrolled in Michelle’s workshops are sure to have a wonderful time. 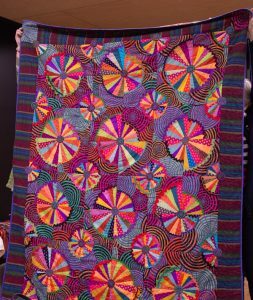 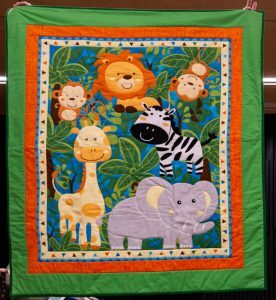 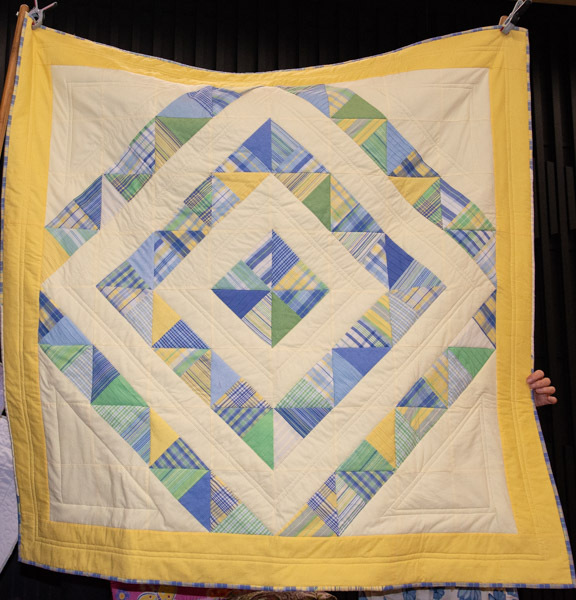 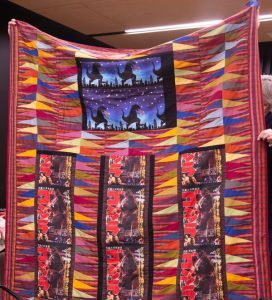 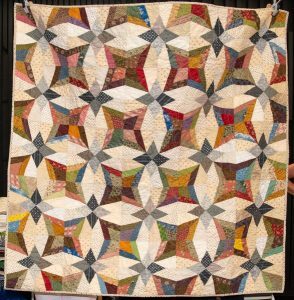 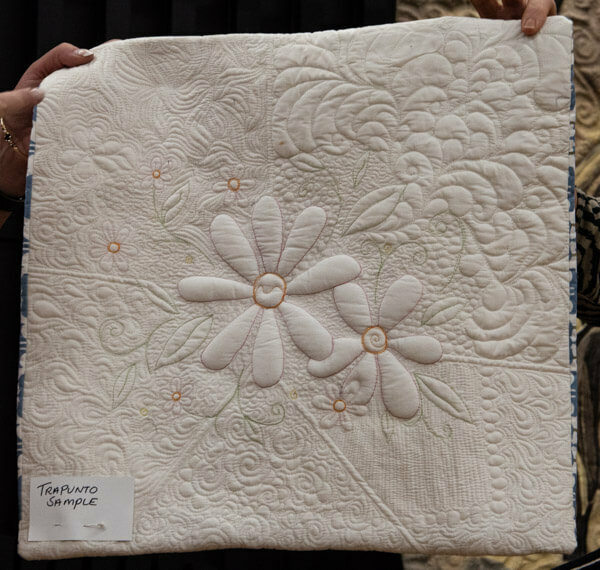 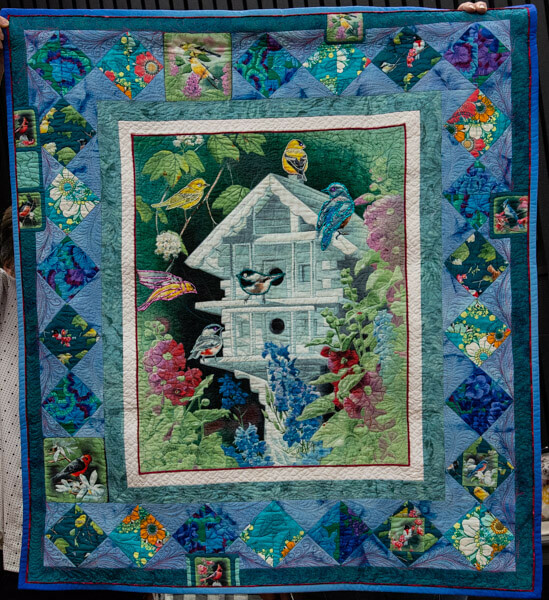 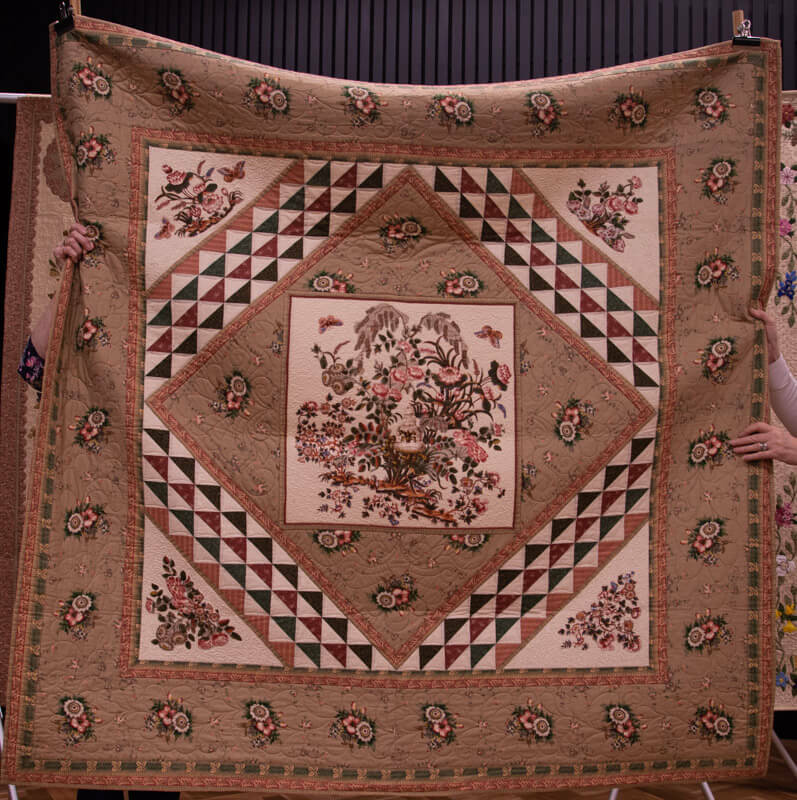 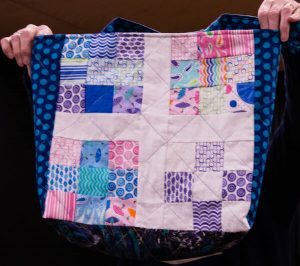 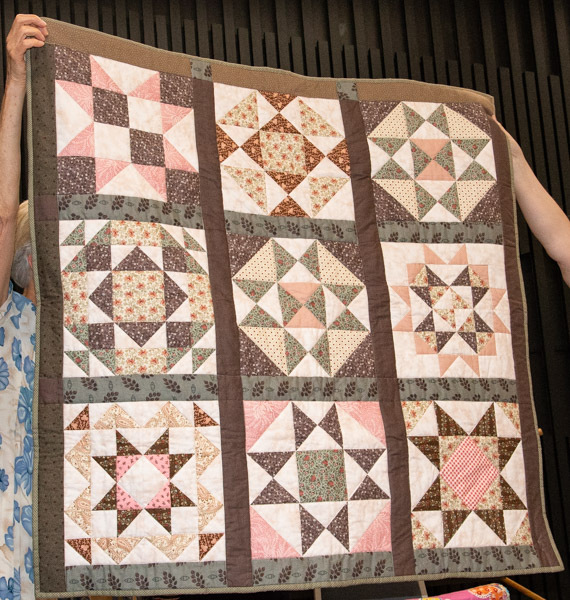 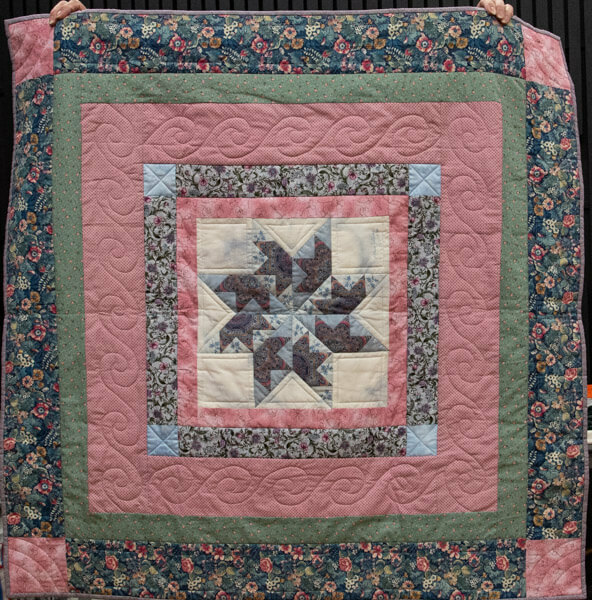 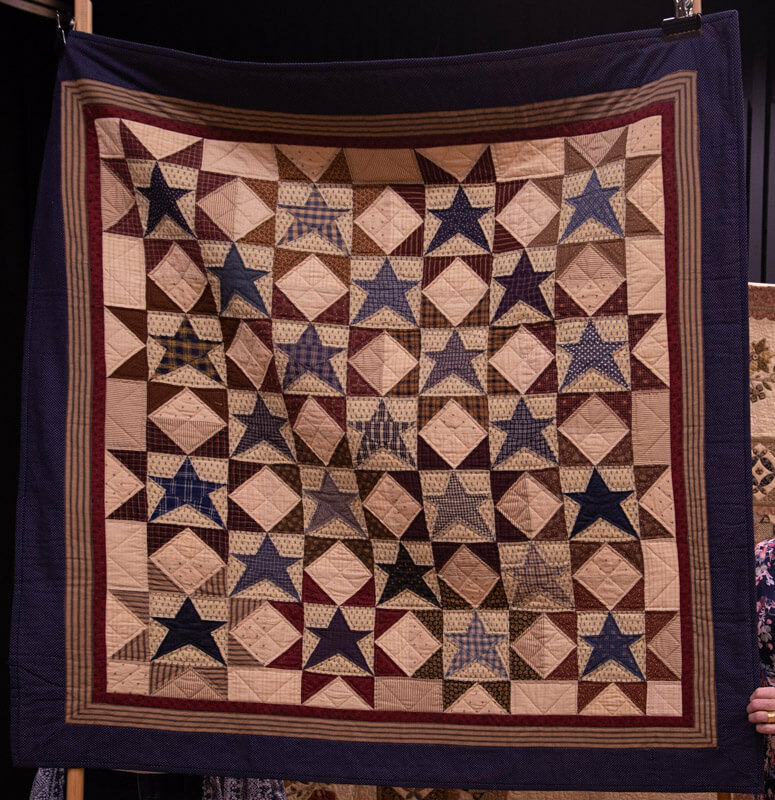 Long time member and serving on the committee for the second time, Dianne brought took the quilt stack of her spare bed to show us at the March meeting. 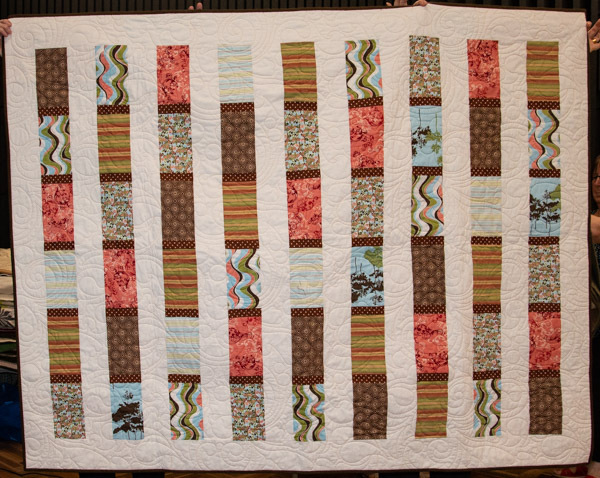 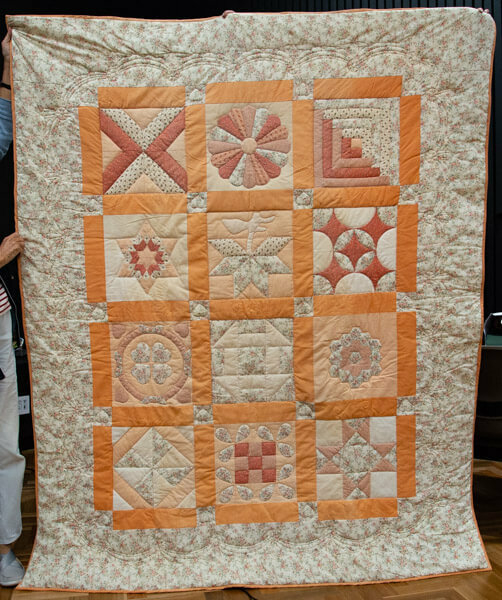 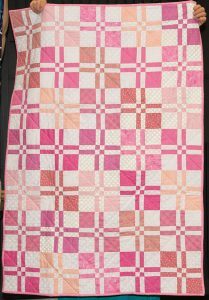 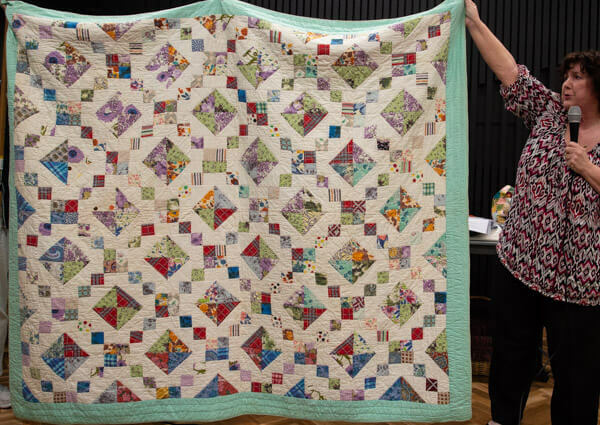 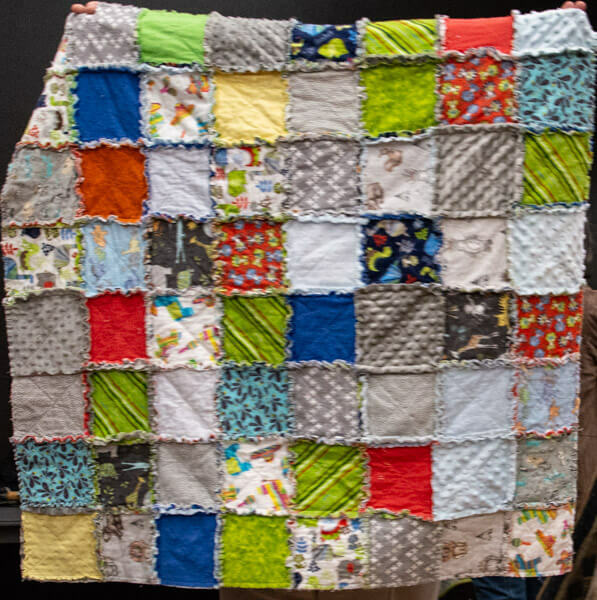 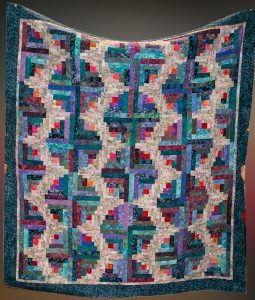 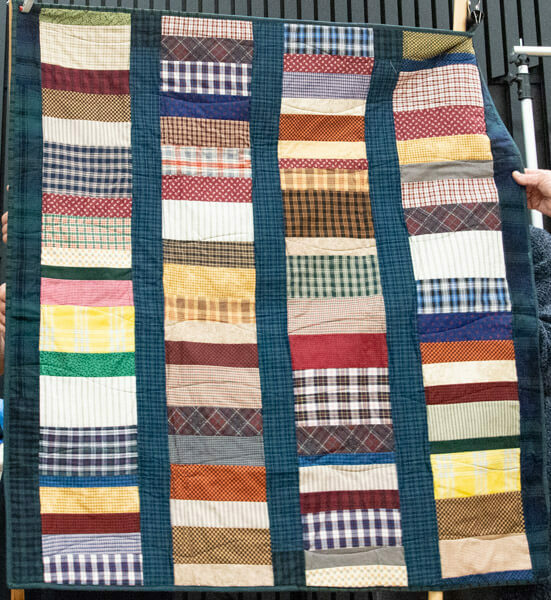 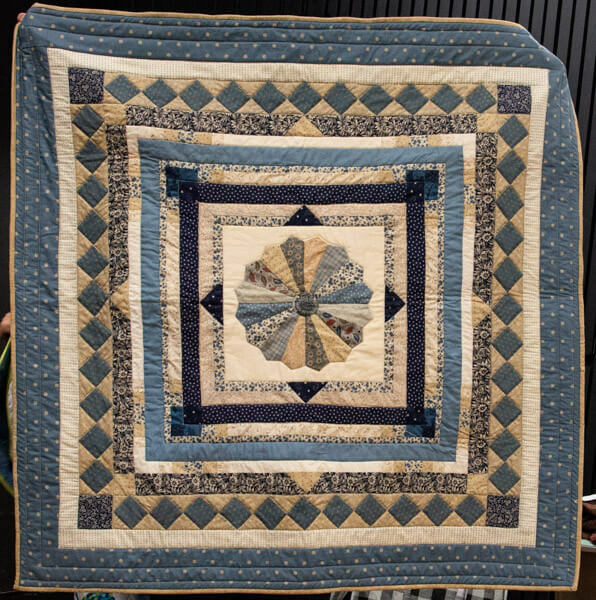 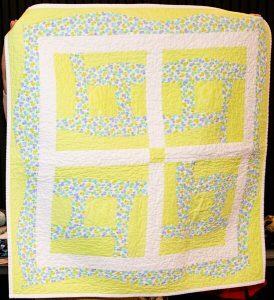 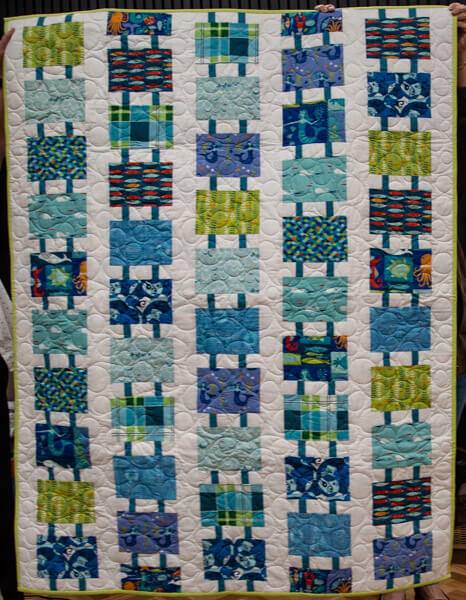 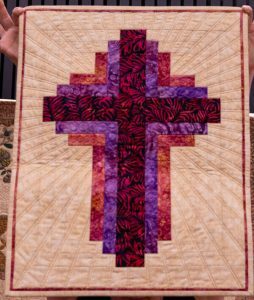 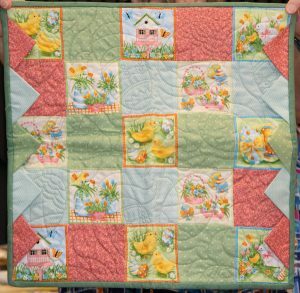 This first quilt began in a sampler class with Hazel at Craft Connection in 1990. 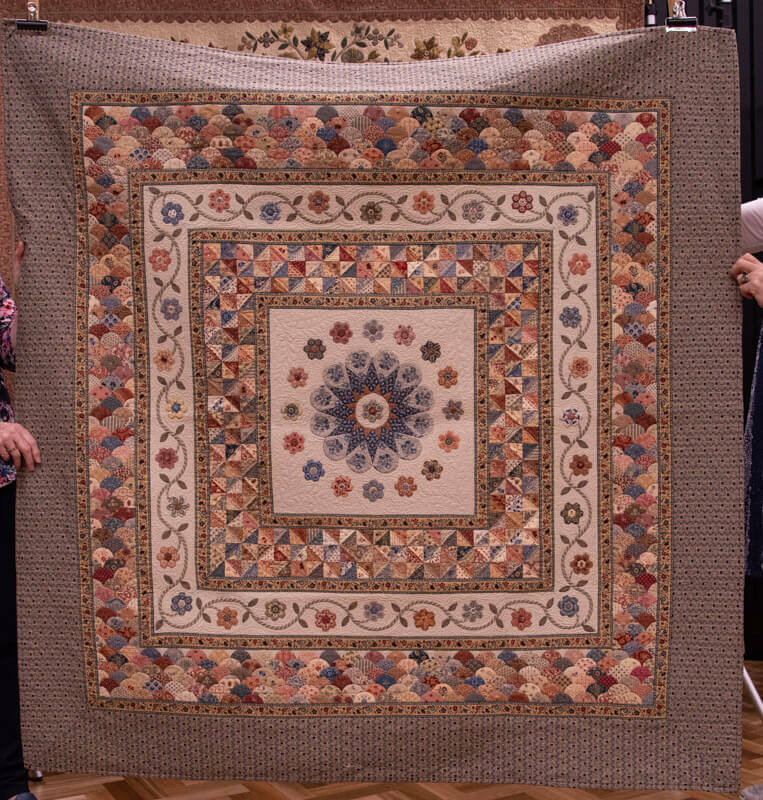 There were six in the class and nearly thirty years on three of them still get together regularly. 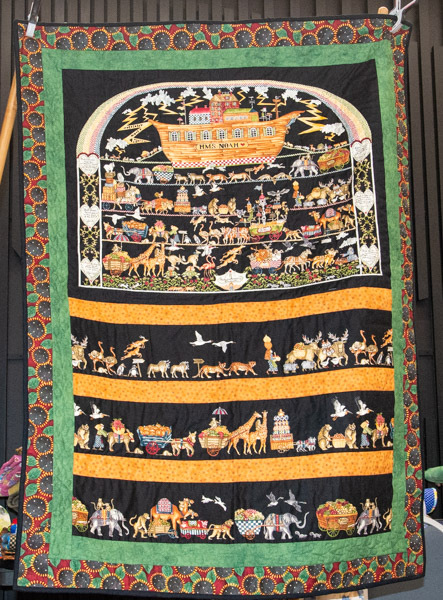 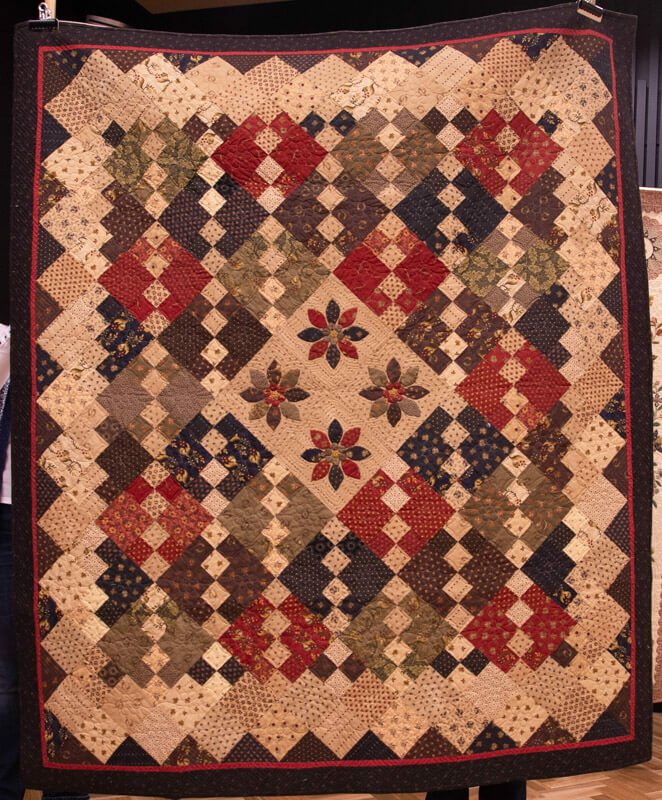 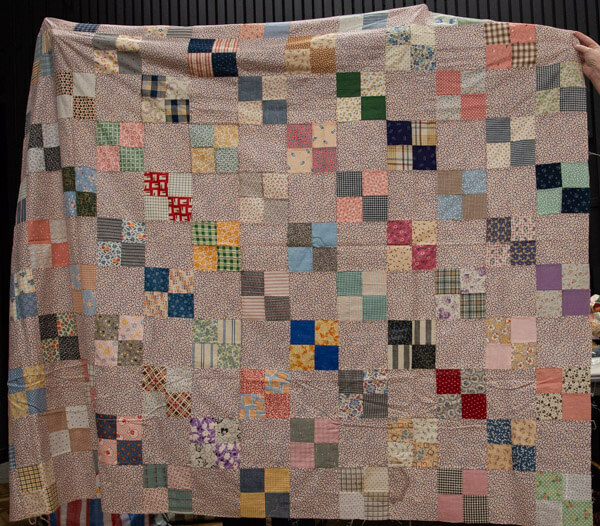 There were a lots of quilts to see, some had taken many years to get to a finished state. 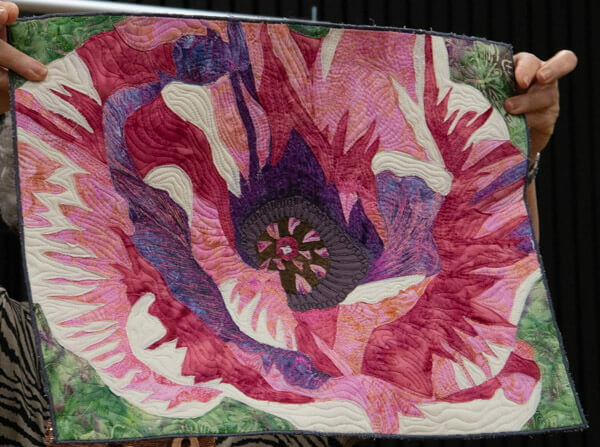 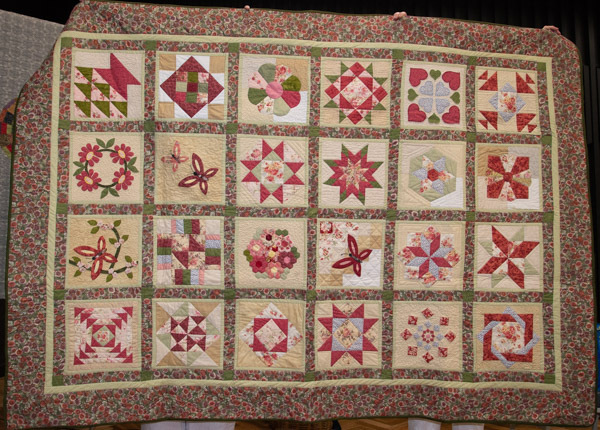 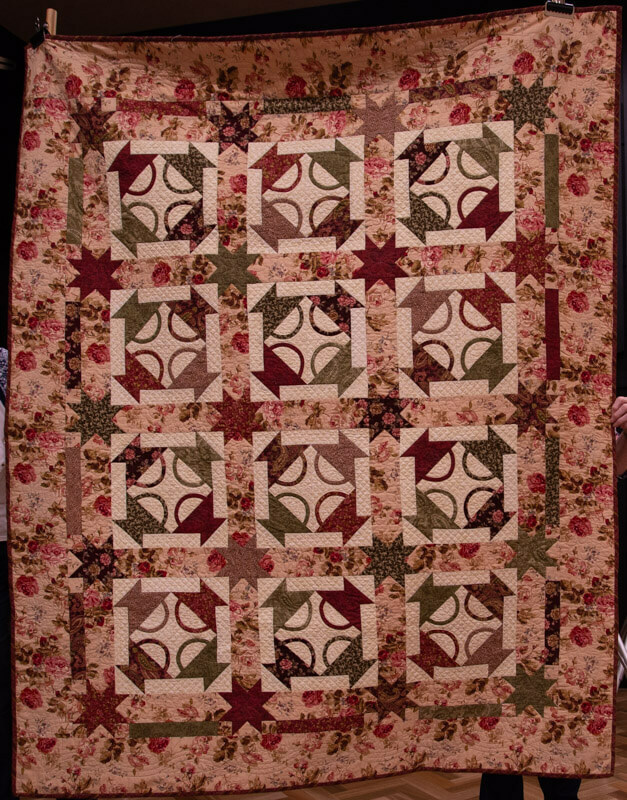 The Grub Roses quilt was done with Jill Farr of Beaconsfield. 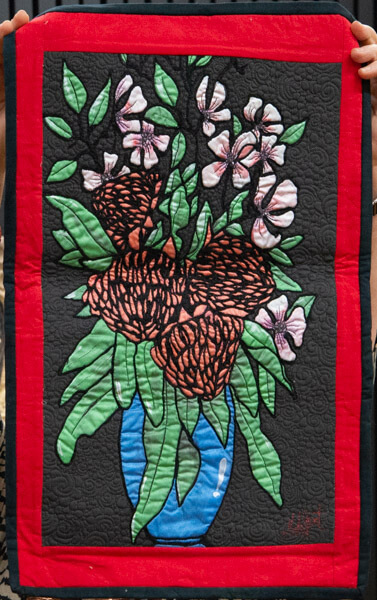 The Leanne Beasley design is beautifully embroidered. 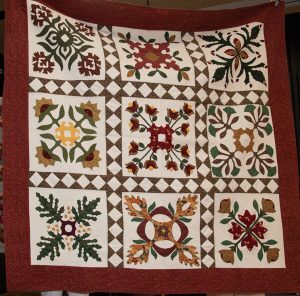 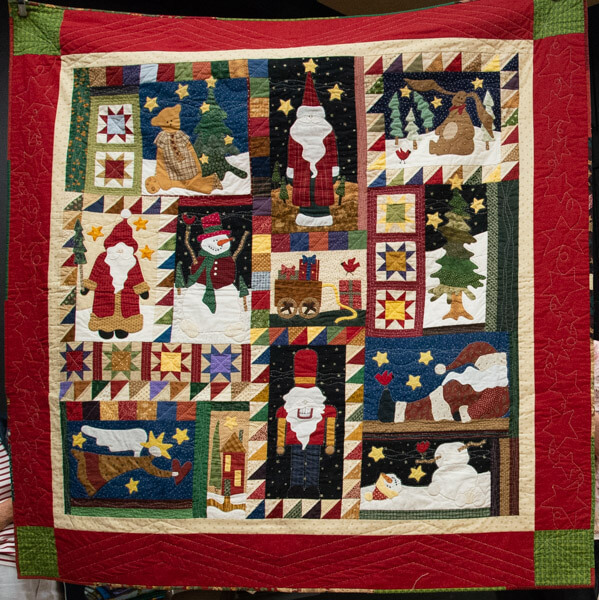 No surprise at all to see a Christmas Quilt, this one was made as the pattern sample for Craft Cottage. 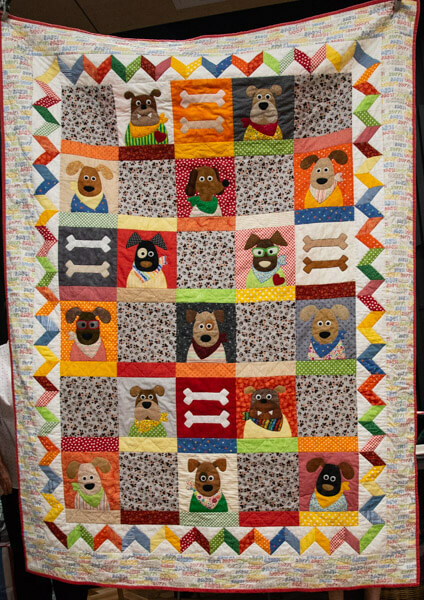 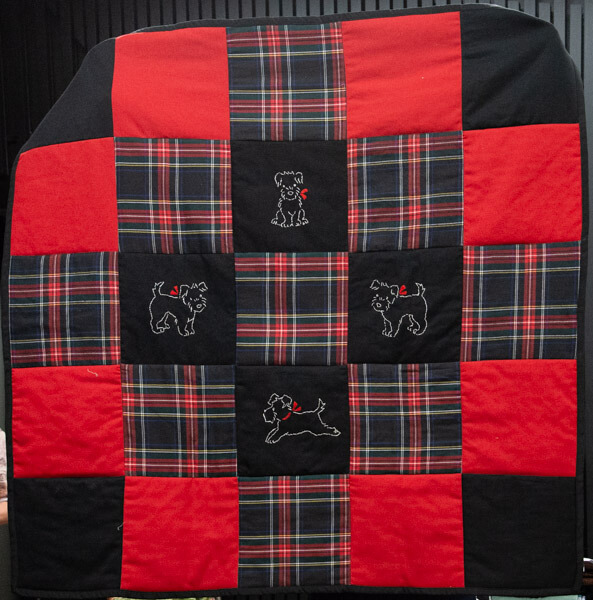 A scottie dog quilt made for her sister, a scrap quilt with flannel sheet wadding and quilted by hand. 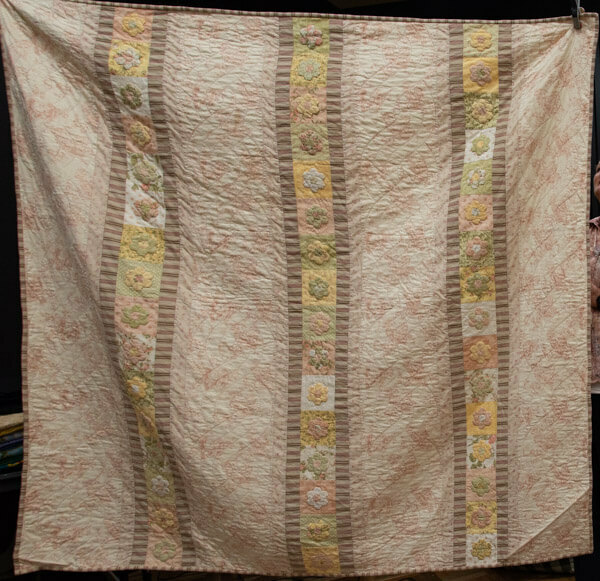 Finally, Bo Peep by Rosalie Quinlan, made in a workshop many years after buying the pattern. 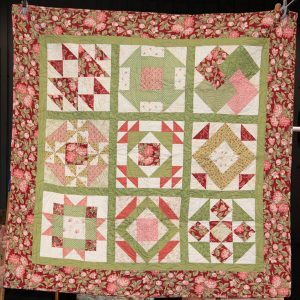 After buying a few quilts and tops here and there Dianne realises she is now also a collector of vintage quilts. 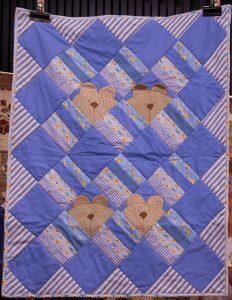 Click on the photo to read more about each quilt. 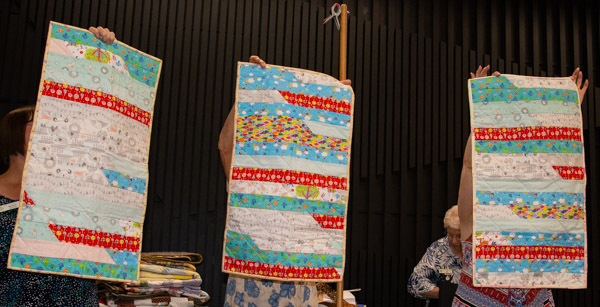 Fortunately there were lots of helpers to hold up the quilts at our February meeting, there were so many on show. 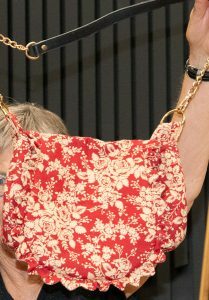 Click on any image to have a closer look. First up new committee member Wendy who is our Library Coordinator. 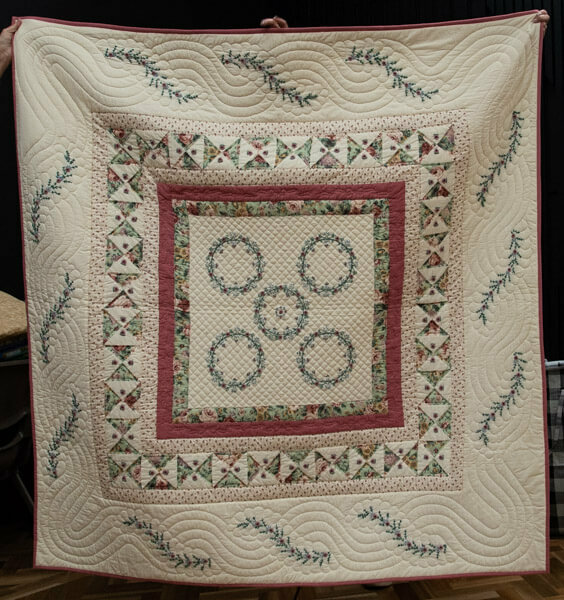 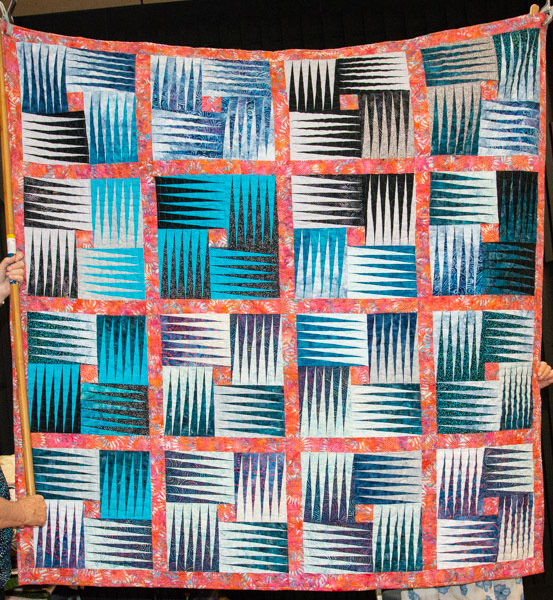 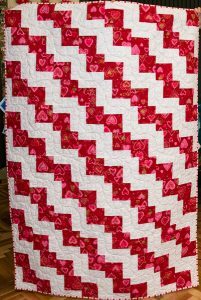 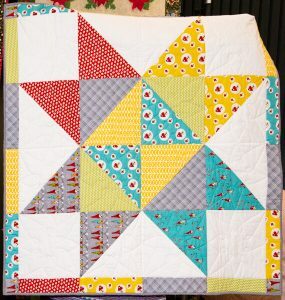 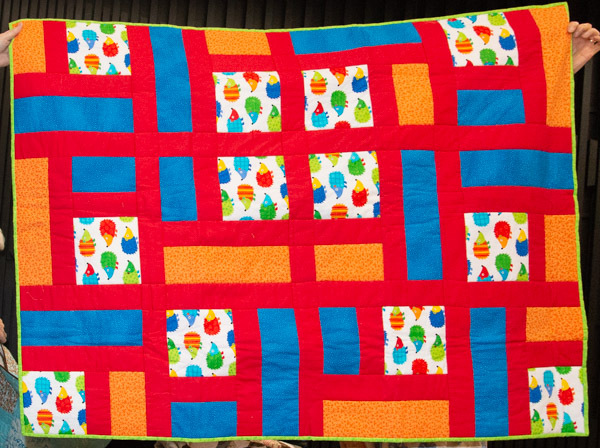 While she is a newish member, she explained that she is not new to quilting. 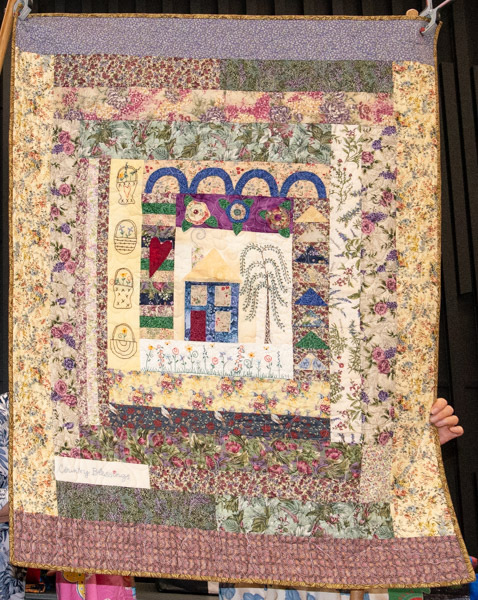 She started very young thanks to a grandfather in the textiles industry. 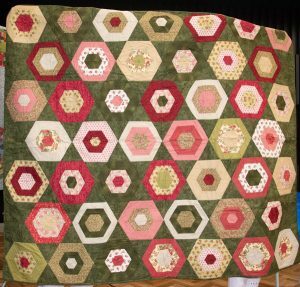 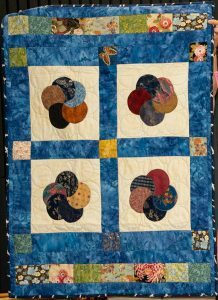 Her first attempt at patchwork was as a young child, piecing hexagons cut from her grandfather’s samples. 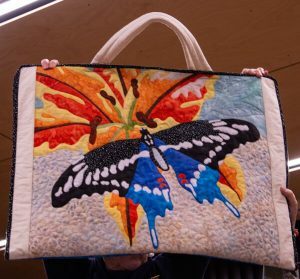 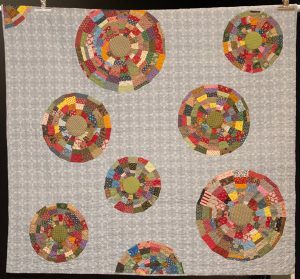 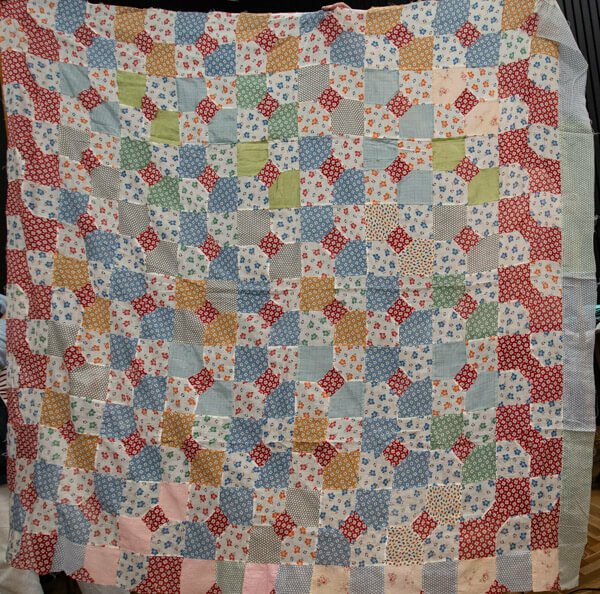 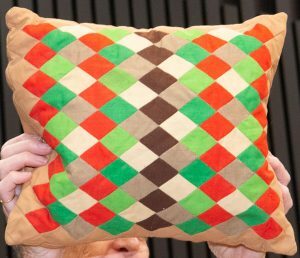 This was followed by a cushion made in high school, a hanging made with Margaret Rolf patterns and then away she went with many full size quilts. 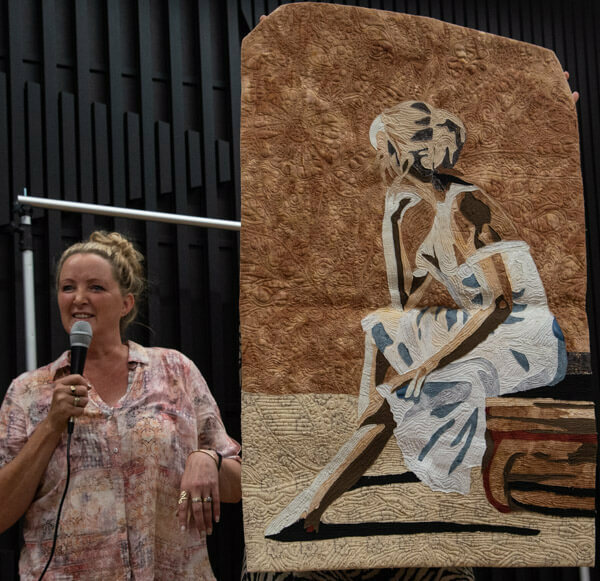 Wendy has lived in a number of countries due to the demands of her husband’s work. 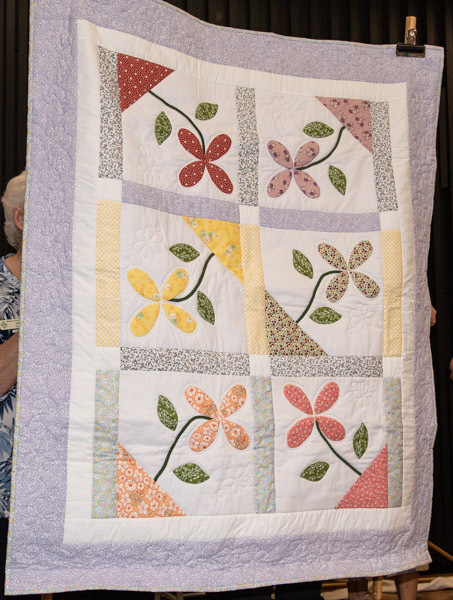 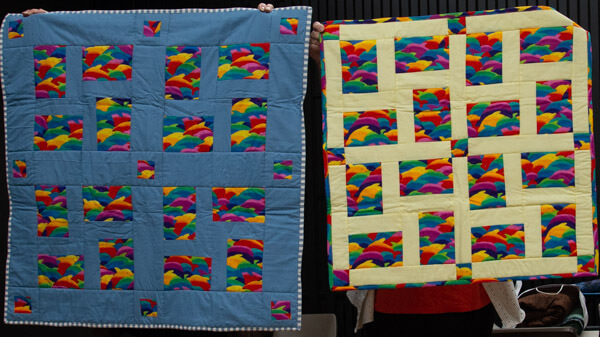 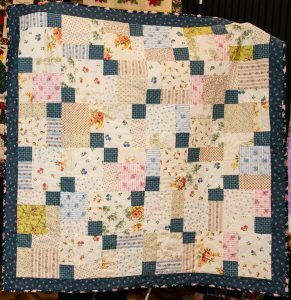 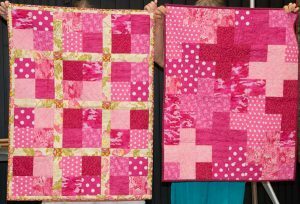 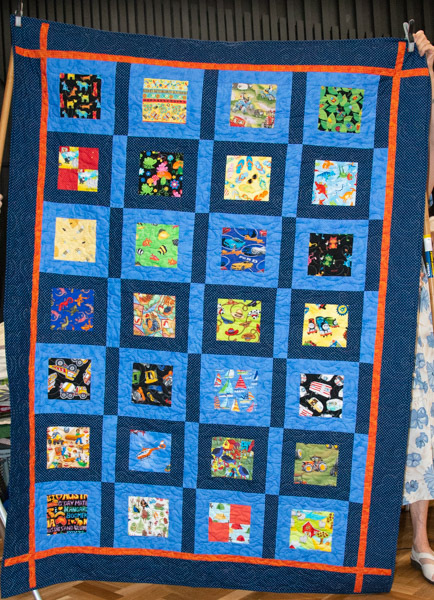 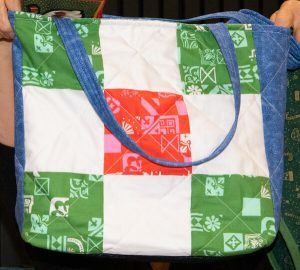 She has found quilting to be an excellent way to meet people and get involved in the community where ever that may be. 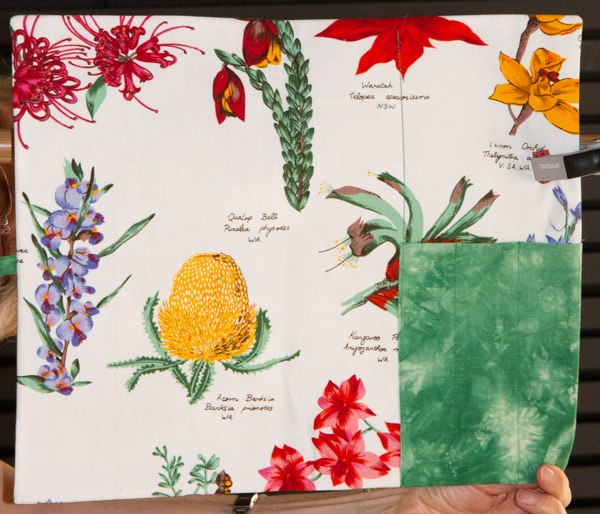 The patterns and fabrics came in parcels sent from Australia, but with some local touches. 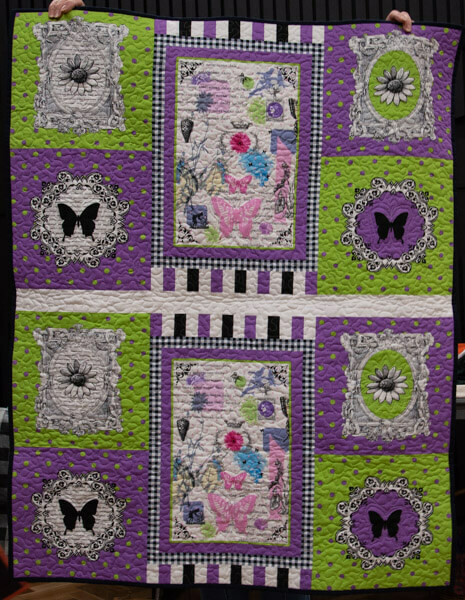 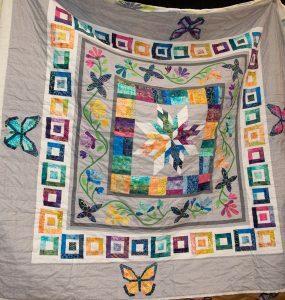 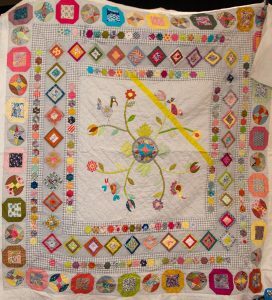 The butterflies on the above quilt are beaded brooches made in Tanzania. 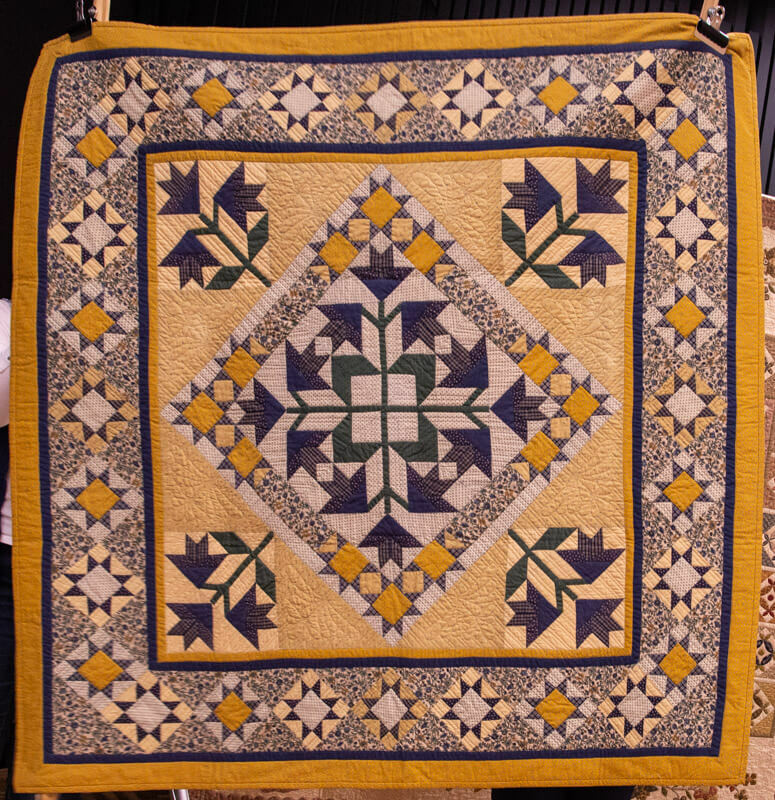 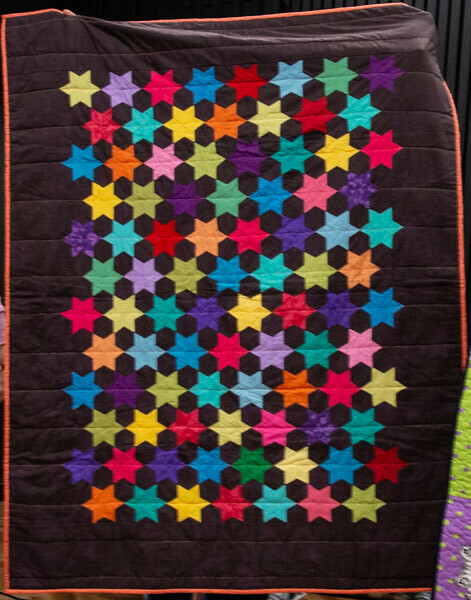 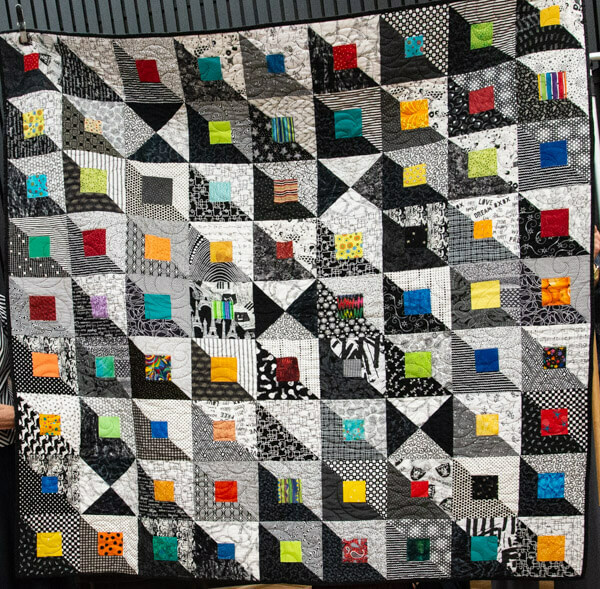 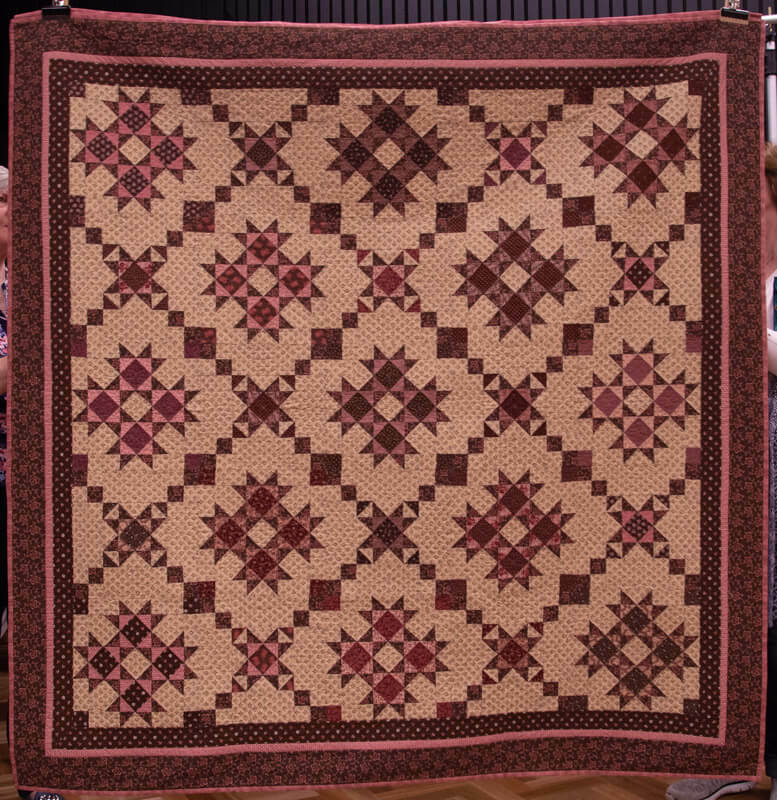 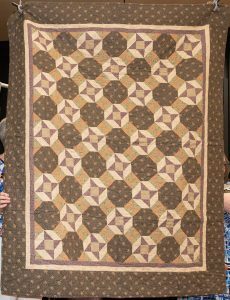 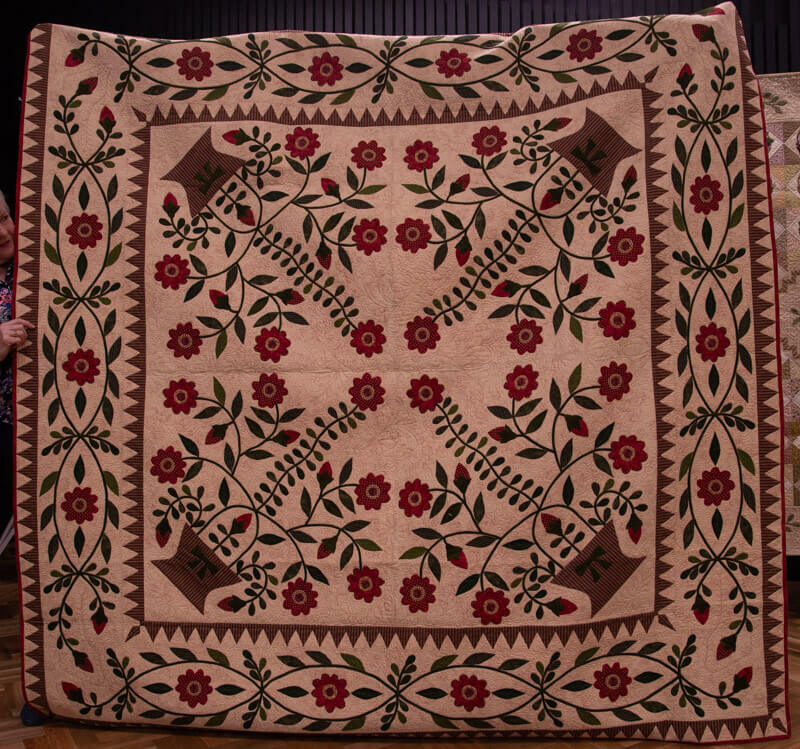 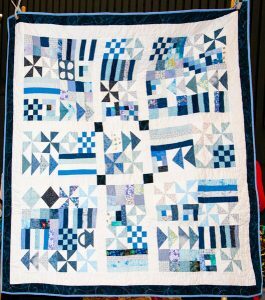 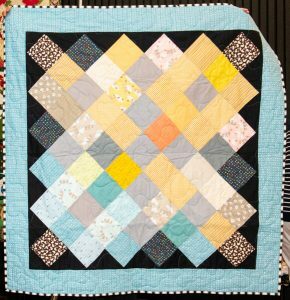 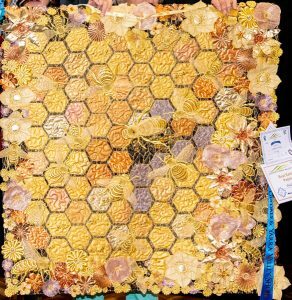 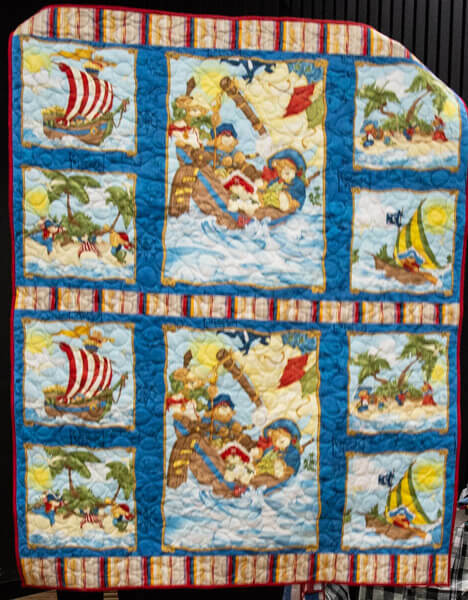 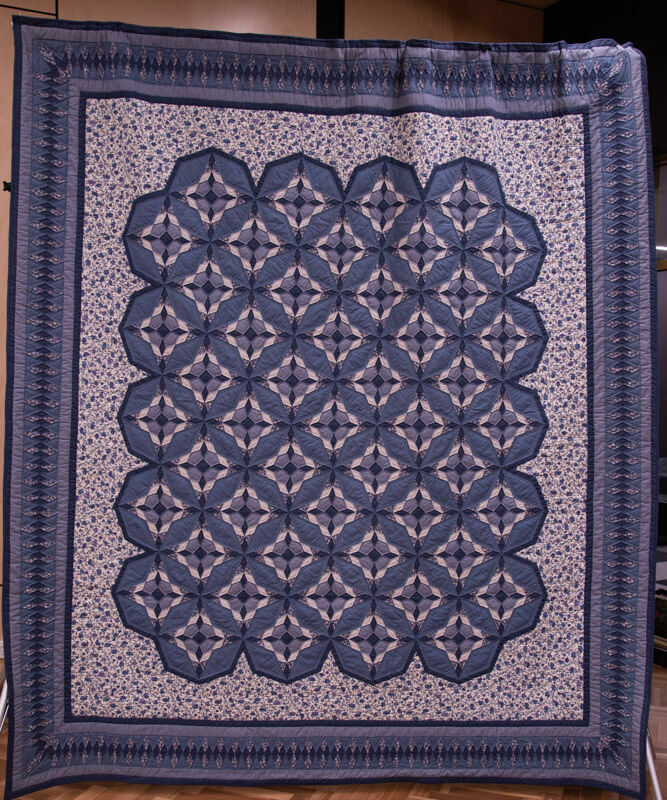 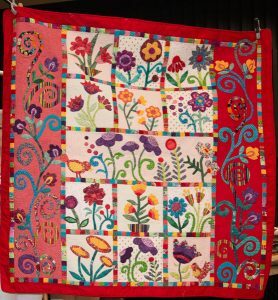 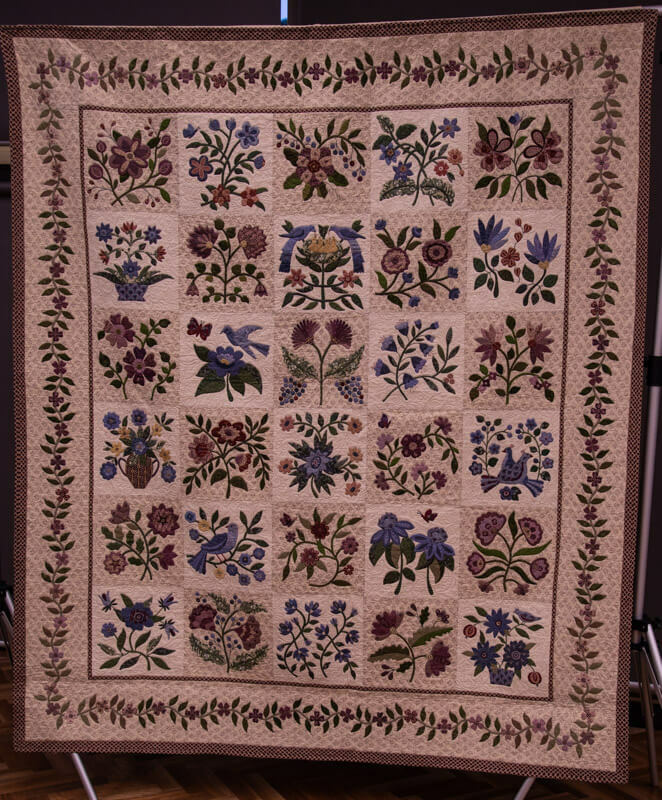 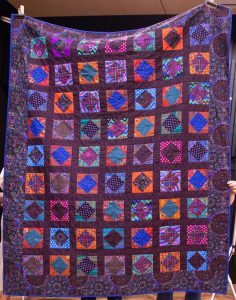 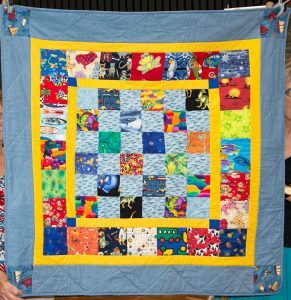 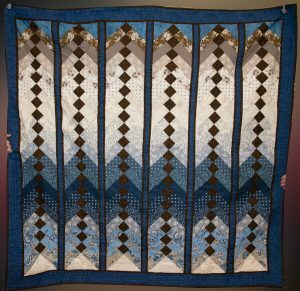 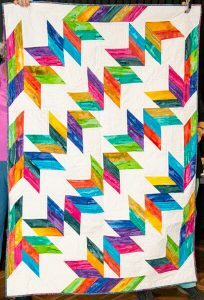 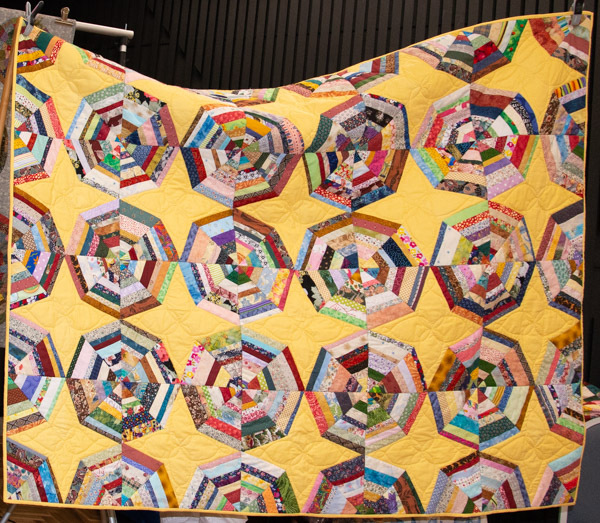 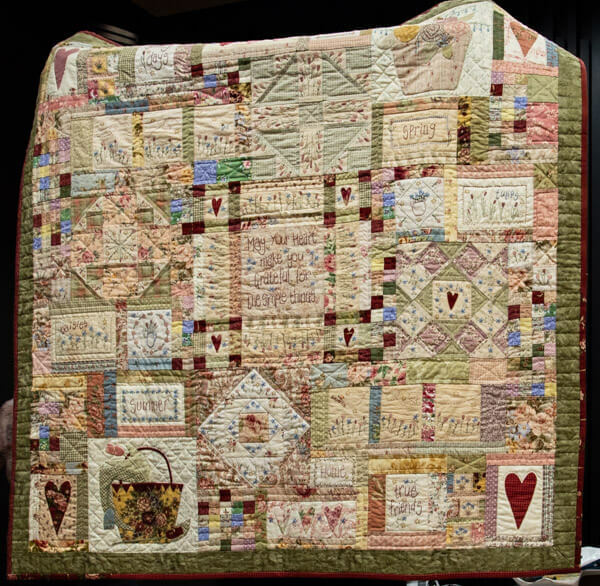 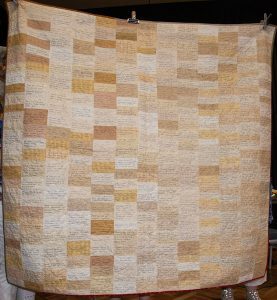 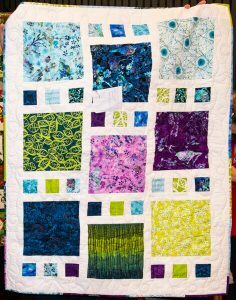 This quilt is very special, a member of the guild in Sweden designed a block each month to share with the group. 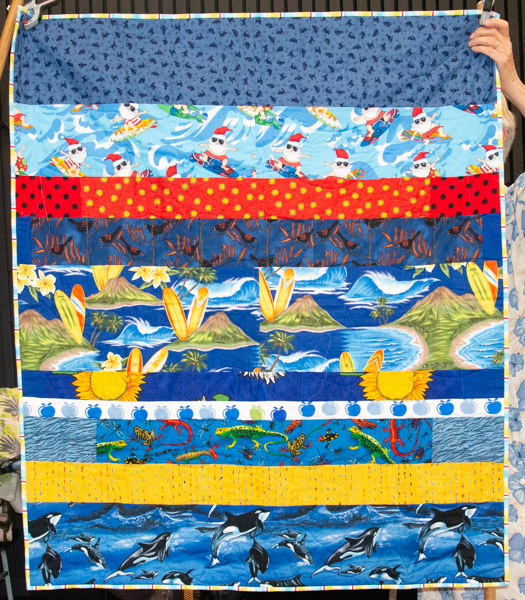 Wendy also made quilts in Singapore before finally returning to Melbourne. 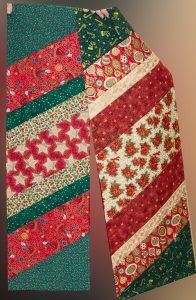 She is still using some of the special fabrics from her grandfather and has obviously inherited a love of textiles. 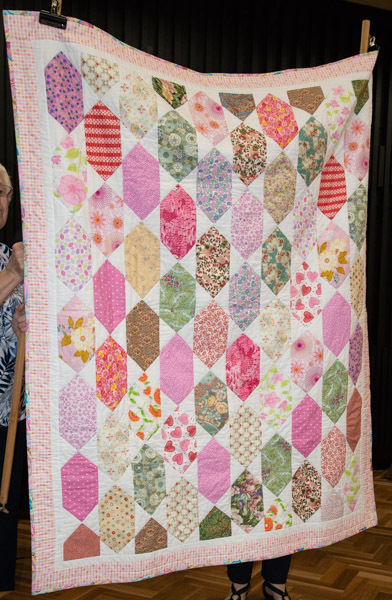 What a treat to have the very entertaining Mrs Martin visit our group. 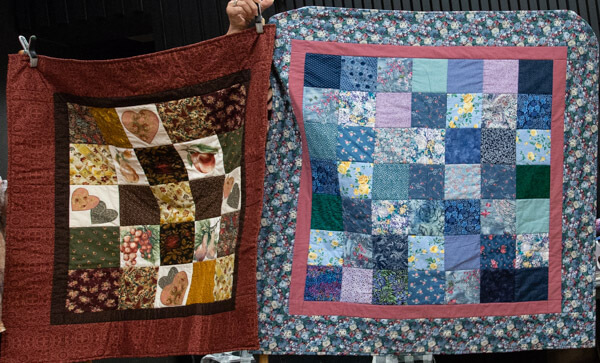 Mrs Martin’s Quilt Shop opened 15 years ago, but was fully planned in Karen’s head long before that. 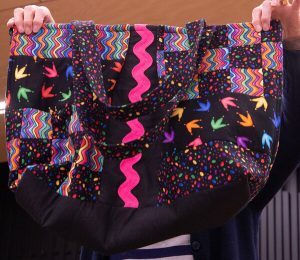 The name comes from her primary school class who knew she was planning to open a shop. 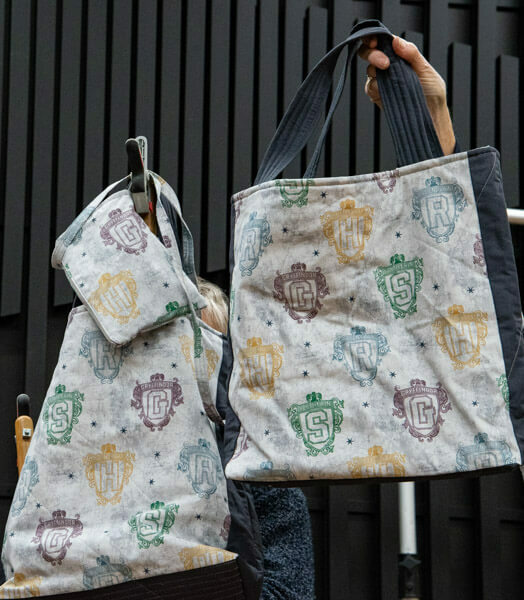 Living and working in the same community means that these students are now regular visitors to the shop, with their own children in tow. 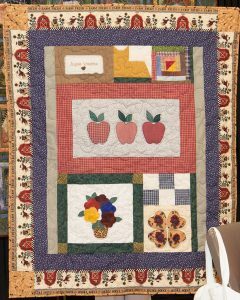 The shop is now in her home, open three days a week and true to her community commitment, the shop visits as many events as possible, taking her treasure trove of patterns, fabrics and notions to where quilters gather. 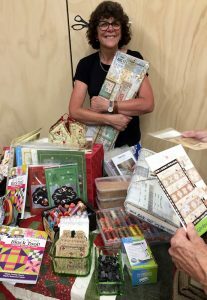 So of course the shop came to Waverley too. 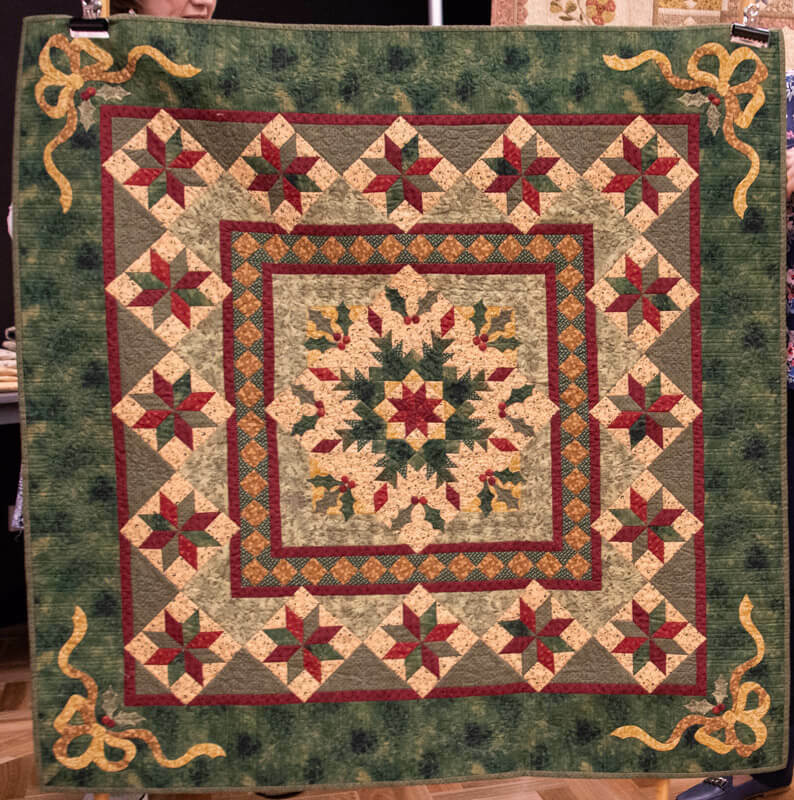 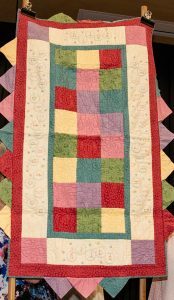 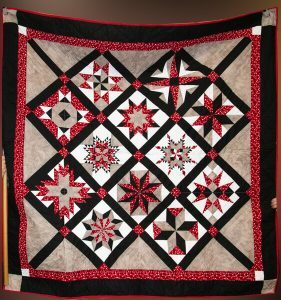 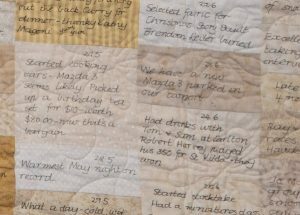 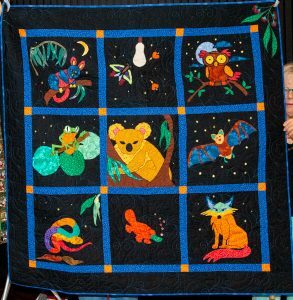 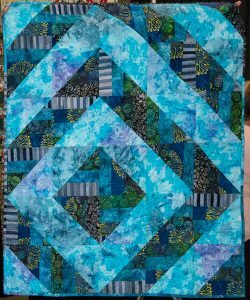 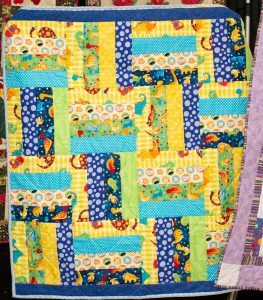 Quilting seems to occupy all Karen’s waking hours, as well as running the shop and stitching days, she organises the Monbulk CFA Quilt Show. 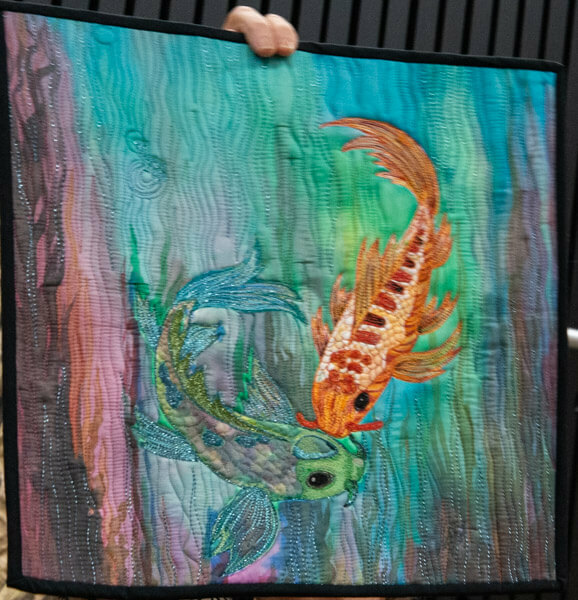 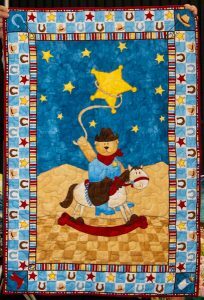 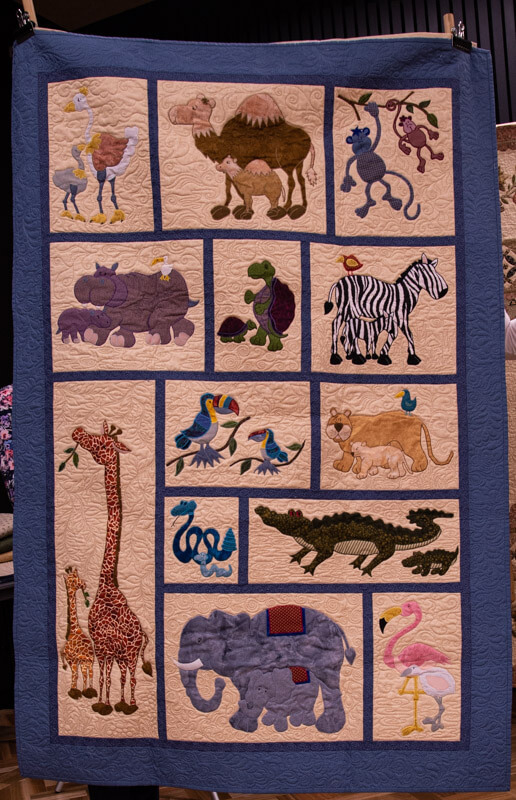 More recently she has added taking tours to the US to her suite of quilting activities, all of which she loves. 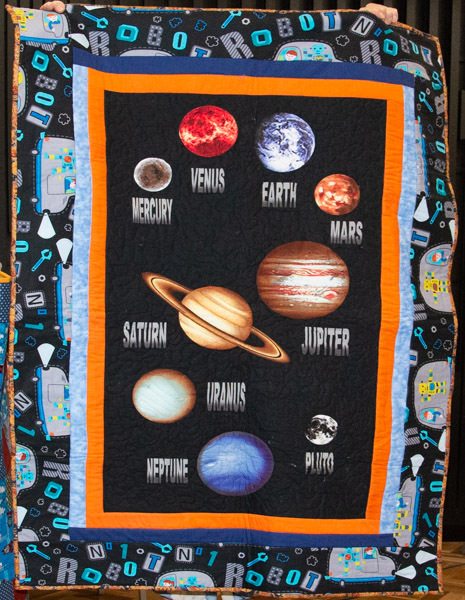 And of course she makes quilts too. 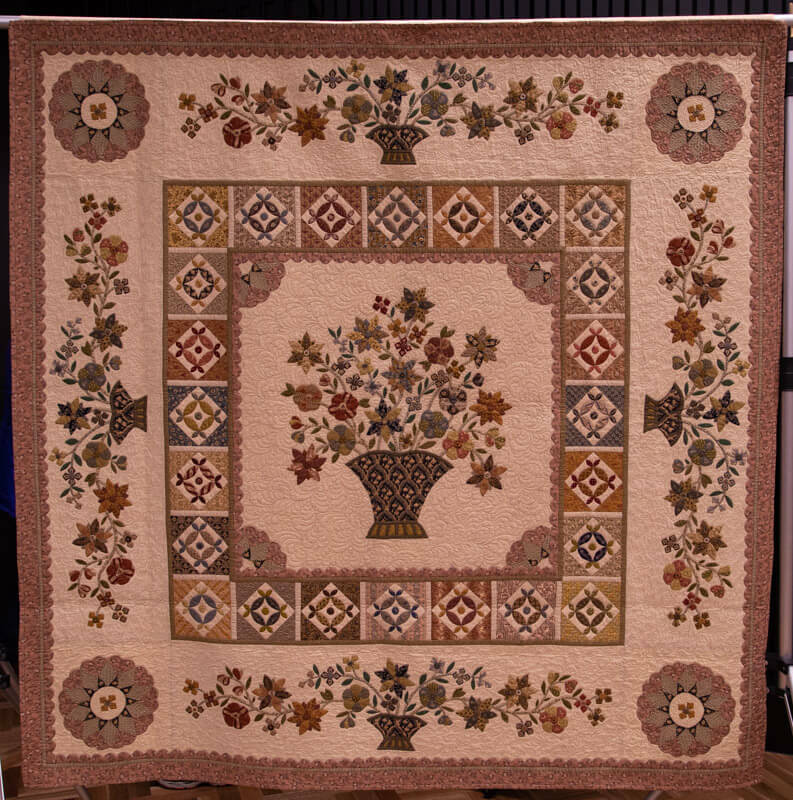 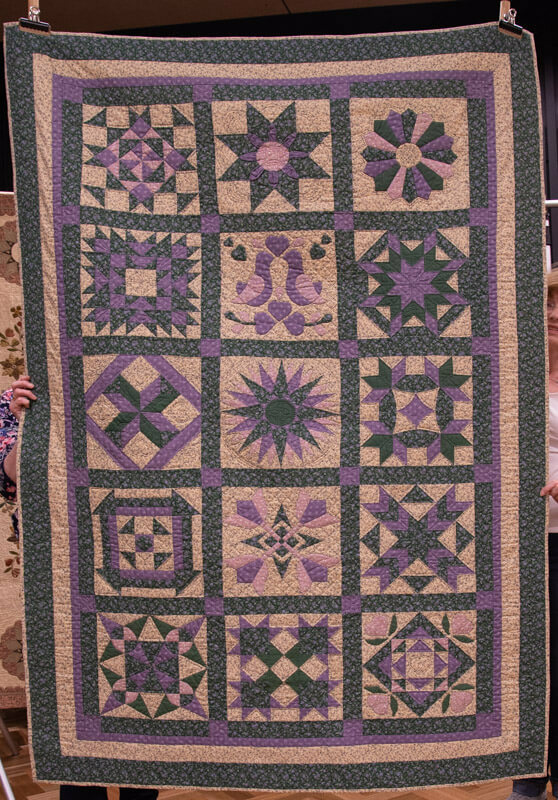 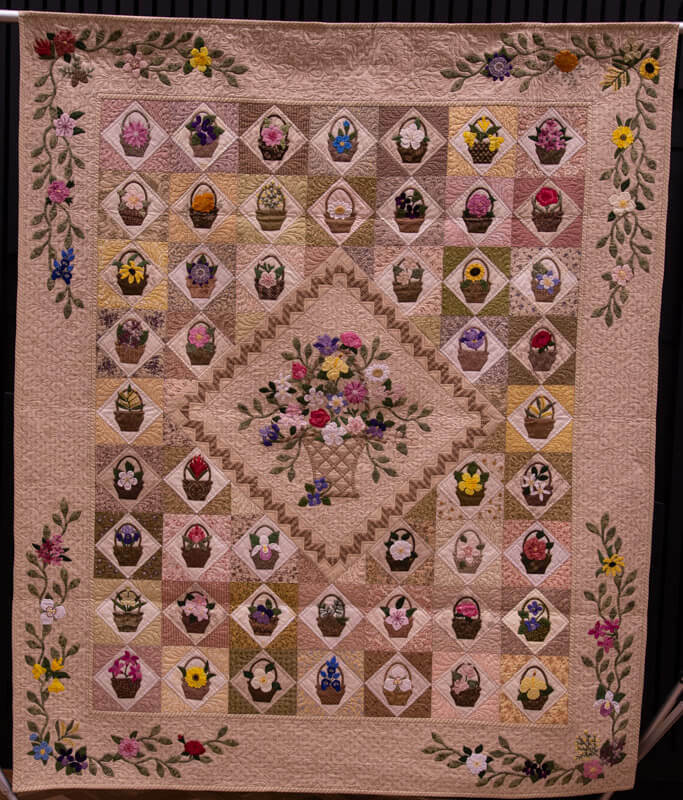 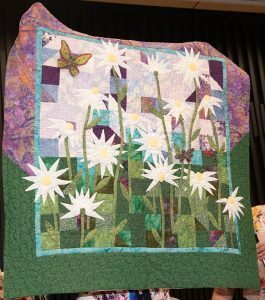 Many of you will have seen Karen Martin and her shop at a Waverley Patchworkers Quilt Show. 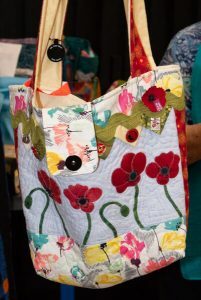 You will also find her shop supporting lots of other events in the area. 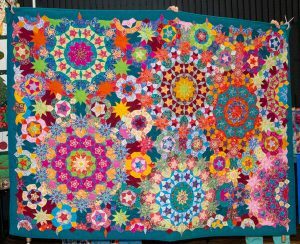 On March 2 she is organising a show herself. 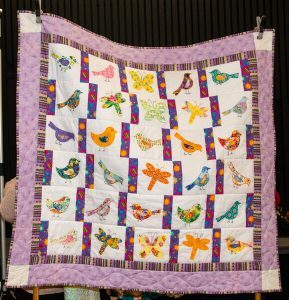 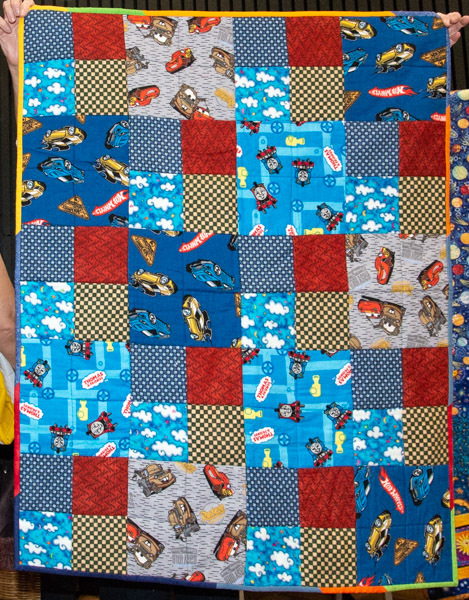 It is the Monbulk CFA Quilt Show with all proceeds supporting the Monbulk CFA. 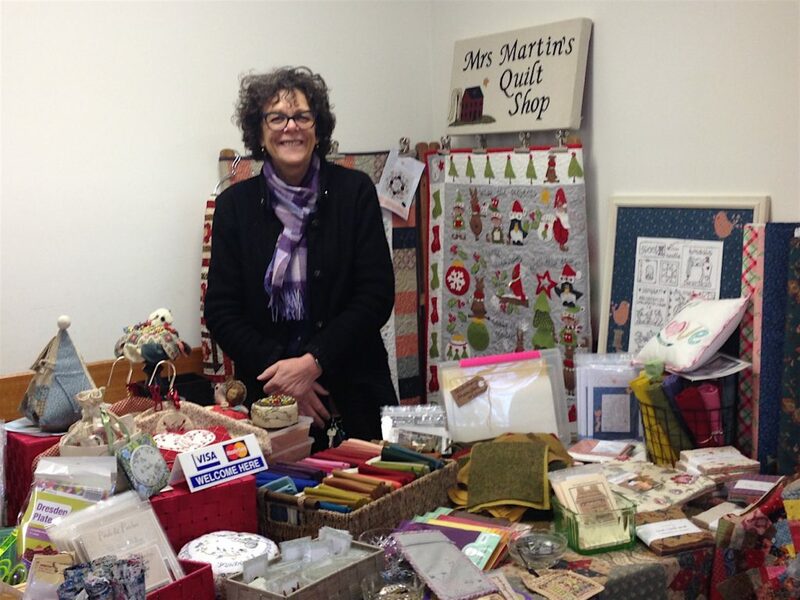 She is squeezing in a visit to our meeting on Monday 25 February and will be telling us all about the fun she has with her shop. 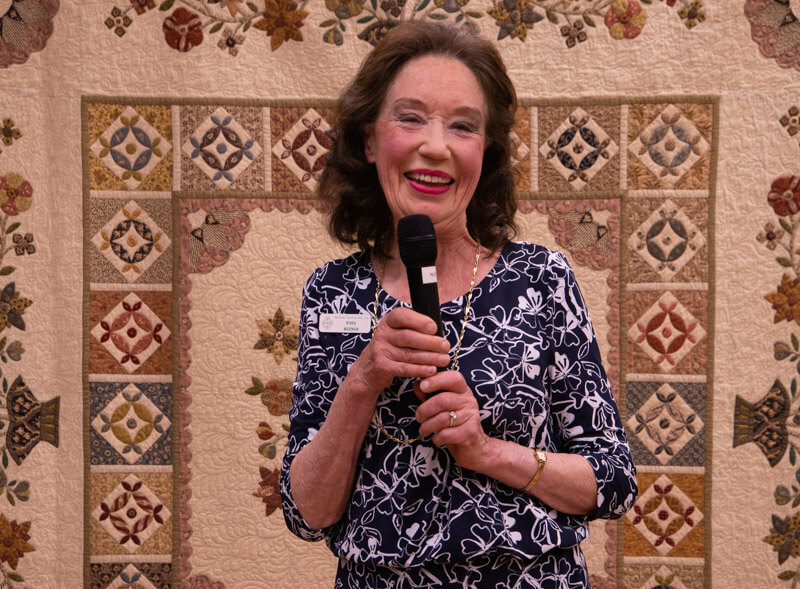 She says that many wonderful things have happened in her life since she opened Mrs Martins Quilt Show and she has met many wonderful people on the way. 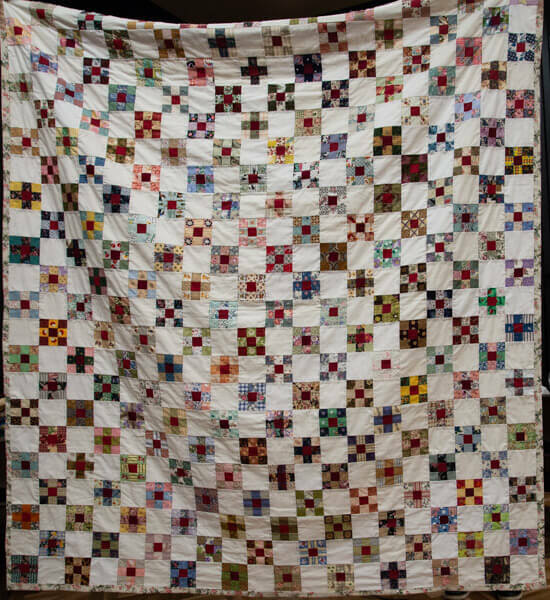 She has promised to show us some quilts too. A warm night in January, a quiz, mini pavlovas and something to stick. 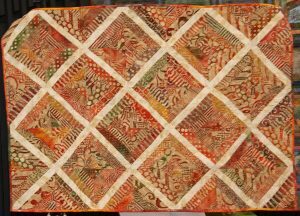 So started the year for Waverley Patchworkers. 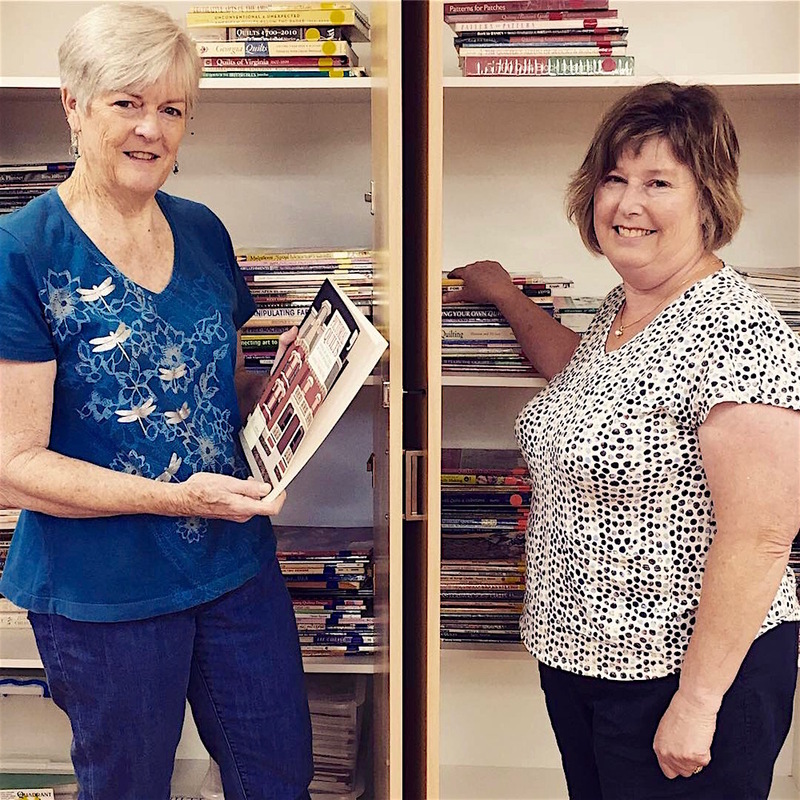 It was lovely to catch up with everyone and return all those books that we have been storing for so long to the upgraded library. 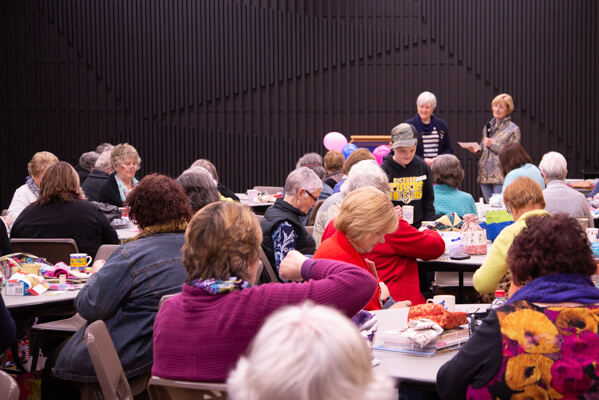 The quiz had an unusual twist, the answers were provided, teams had to come up with appropriate questions that included the word Australia or a nickname. 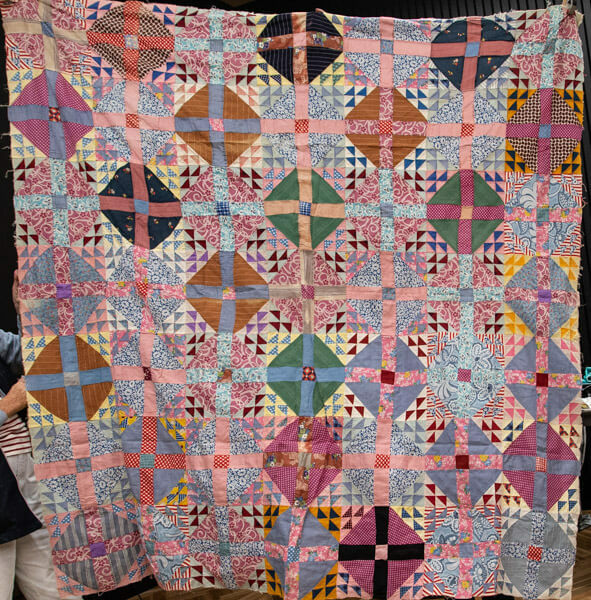 There were four categories including sport which was not popular. 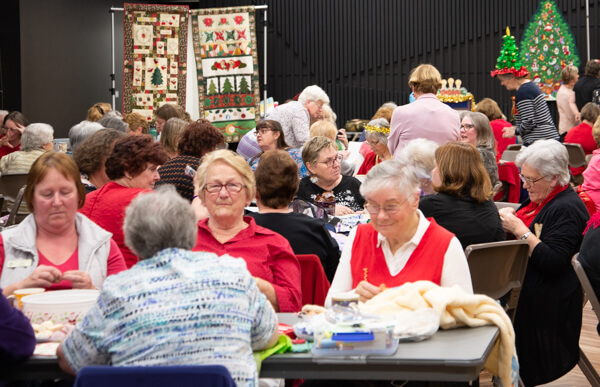 Waverley members do not give up easily, there was lots of whispering and head scratching, a tiny bit of googling, a hint or two and finally some winners. 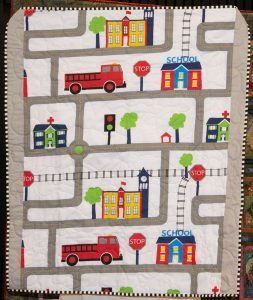 So how would you go? 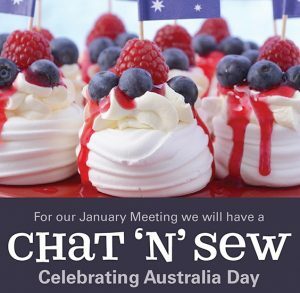 Here is the Australia Quiz, just work out the questions that would have these answers. 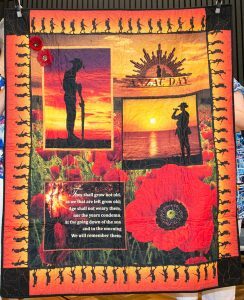 When you are ready to give up, here are the Australia Quiz Questions. 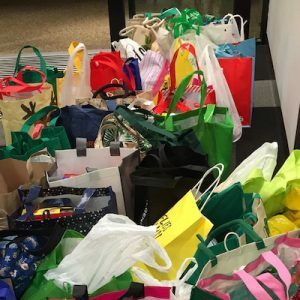 This month it is all about getting things done! Waverley Celebrated 37 years with a Sit and Sew meeting, lots of chatter and certificates for members who had reached 10, 20 and 30 year milestones. 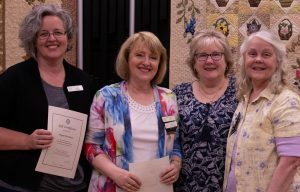 The present went to Waverley Benevolent Society in the form of a cheque for $5,000 from our recent Quilt Show. 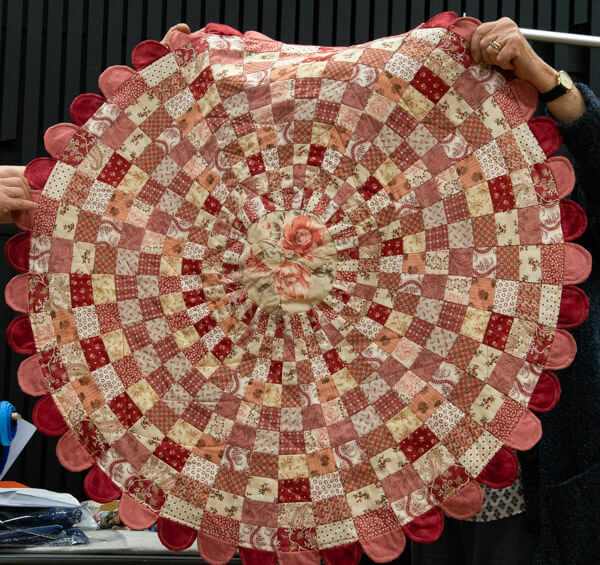 Waverley Patchworkers have a very long history in supporting local agencies. 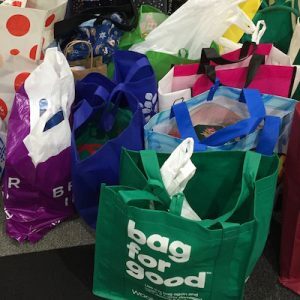 Pat Green from the society told us of the big impact our donation will make in the lives of families struggling to make ends meet. 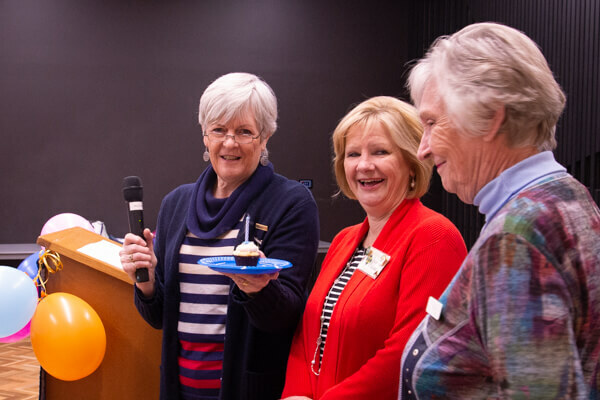 There were cupcakes for all and the candle was blown out by Jacie and Lorna, both celebrating 30 years of membership.